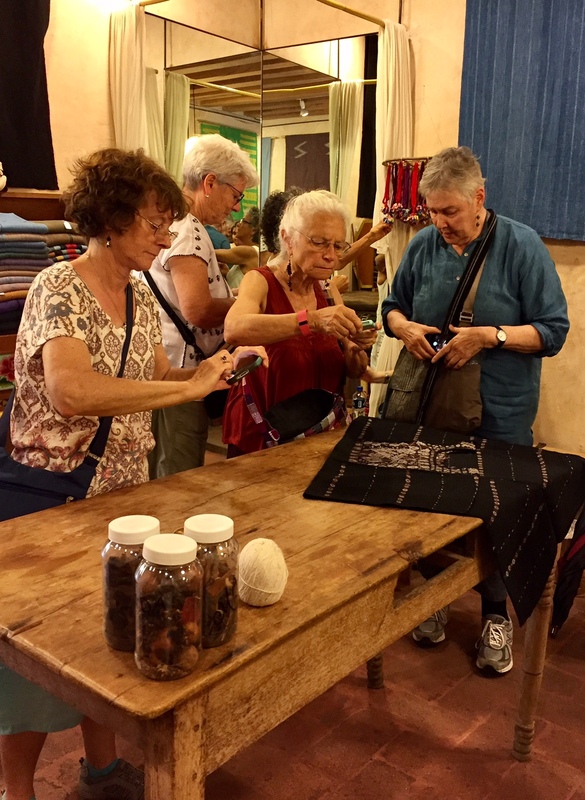 Last Sunday, a group of ten WARP conference participants gathered in the lobby of our hotel at 9:30 a.m. We set out for a day-long walking tour of textiles and folk art, concentrating on a few superb venues to see the best of the best. 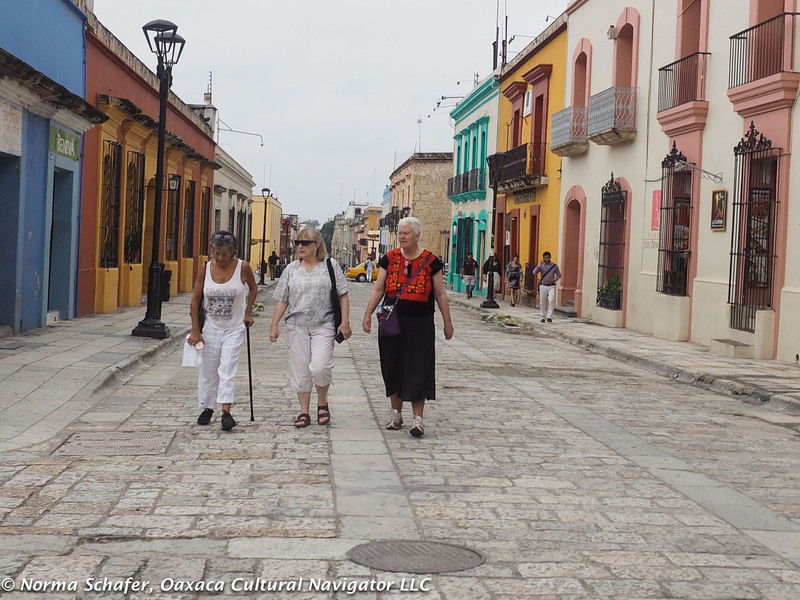 Walking around Oaxaca on a Sunday morning. 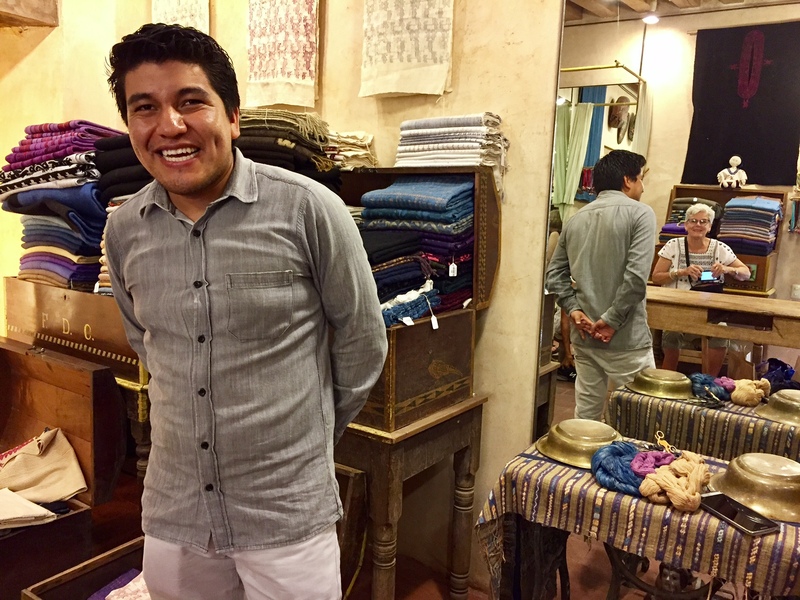 I had set meetings up in advance with two of Oaxaca’s most distinguished shops where the finest textiles are curated and sold, Arte Amuzgo and Los Baules de Juana Cata. 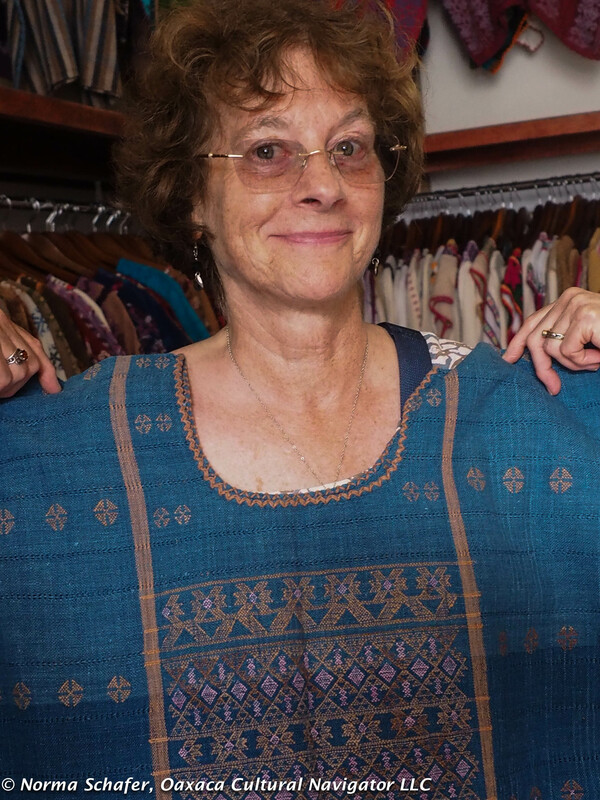 I asked the owners if they would select five to ten of their most outstanding textiles, explain the dye and back-strap weaving process, and talk about the maker and the region of origin. Both are doing an outstanding effort to rescue lost weaving traditions by encouraging villages to bring back an art form on the edge of extinction. 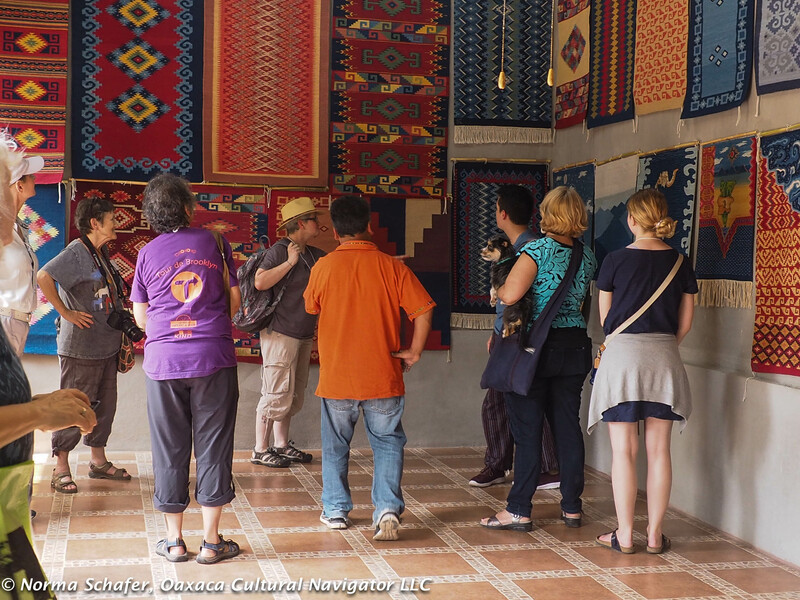 Both have galleries in the historic center of Oaxaca where they offer a market for indigenous artisans to show and sell their work. 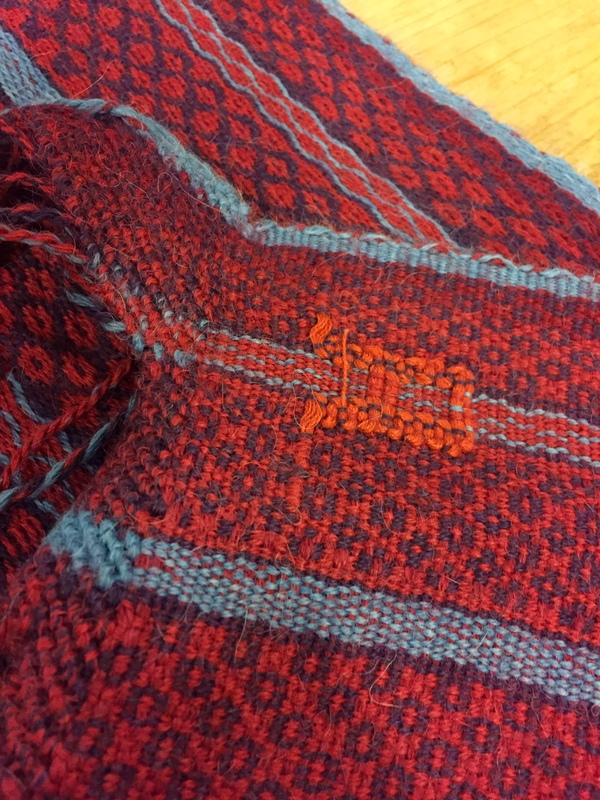 They give attribution to the weavers, too, by including their names and villages on the hang tags of the clothing. 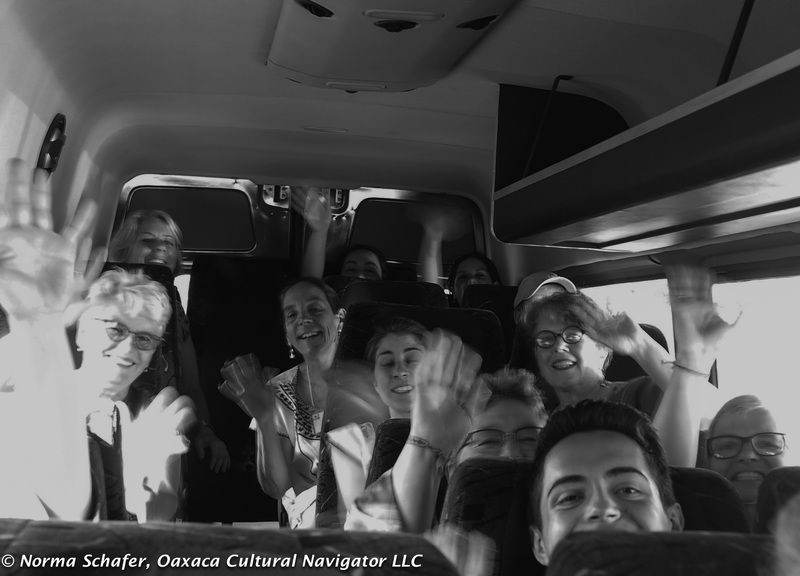 But, first I thought it was important to offer a backdrop to Oaxaca, by explaining a bit about her history and culture. I invited Janet, who was born and raised here, to tell us about her city. 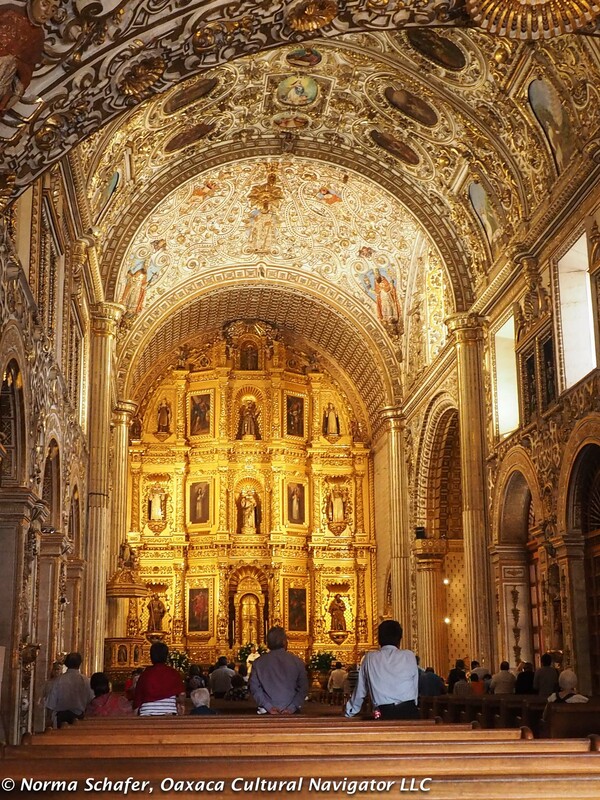 Our first stop was at the cathedral on the Zocalo, where the story of Colonial Oaxaca begins. 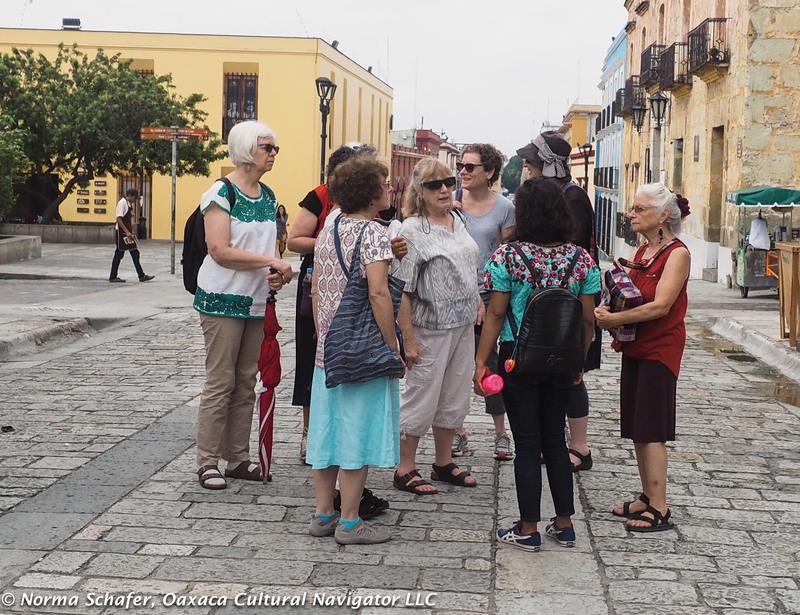 We then walked up the Alcala, making a coffee stop, a shopping stop for hand-made paper earrings (on special request from Louise), and gathered in front of Santo Domingo Church. 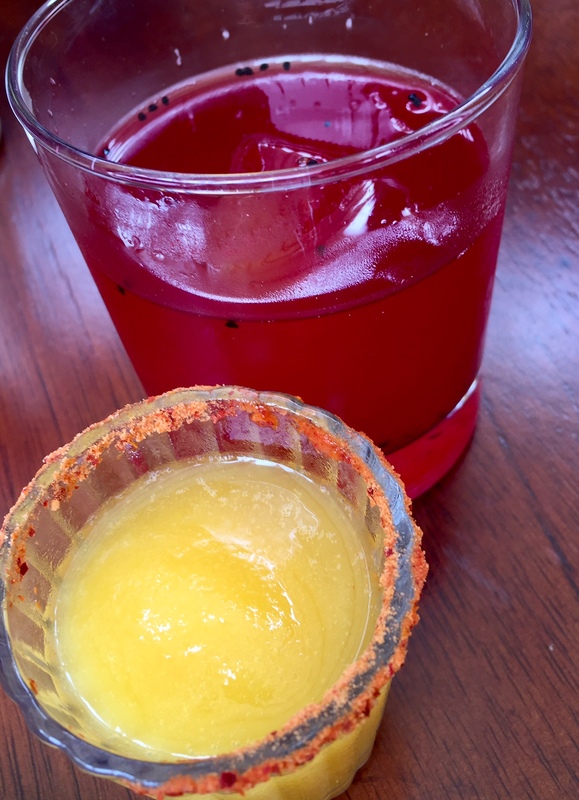 Here, we talked about the conversion of indigenous people, the construction of the city, the power of the Dominicans, and the wealth provided by cochineal. The underside is as beautiful as the front! 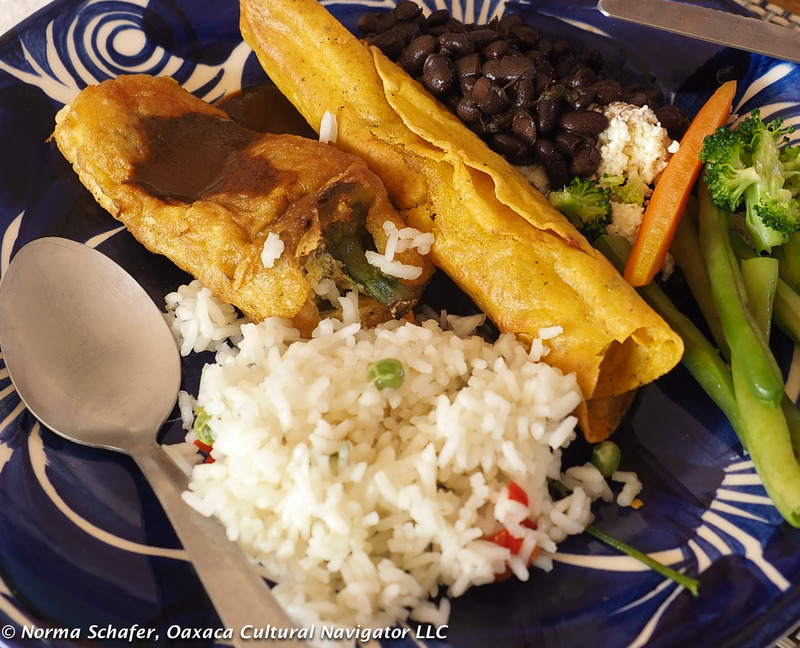 With a stop, too, at Andares del Arte Popular before lunch with a welcome from manager Eric Chavez Santiago, by the time we landed at Los Danzantes, hunger had overtaken us. Lots of walking, but we didn’t even complete 10,000 steps! Here, I will not bore you with our seven course tasting menu that I ordered in advance. It included grilled watermelon salad. Coconut shrimp. Rib eye tacos. Wild mushroom lasagna. 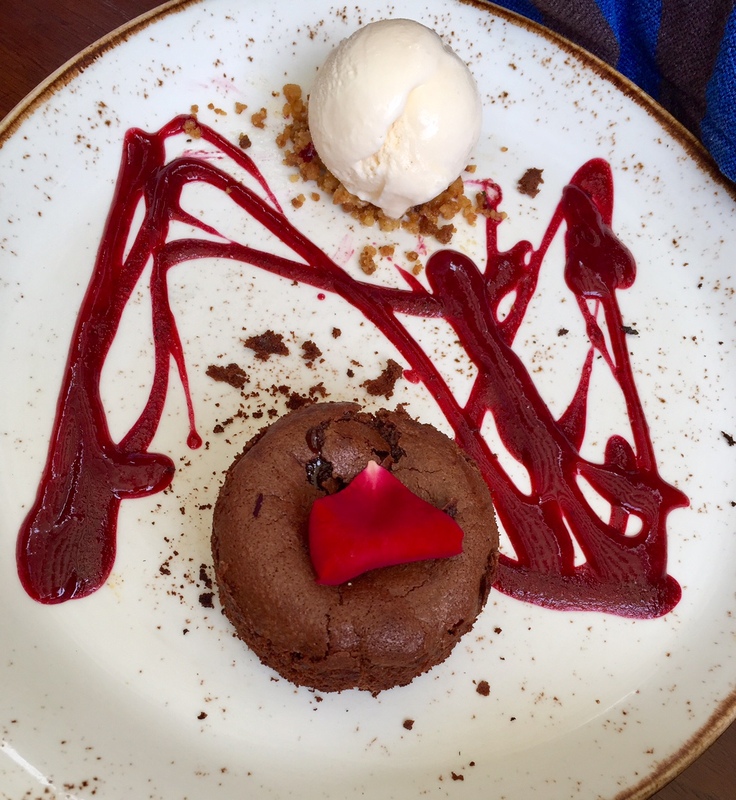 Let’s go straight to dessert. 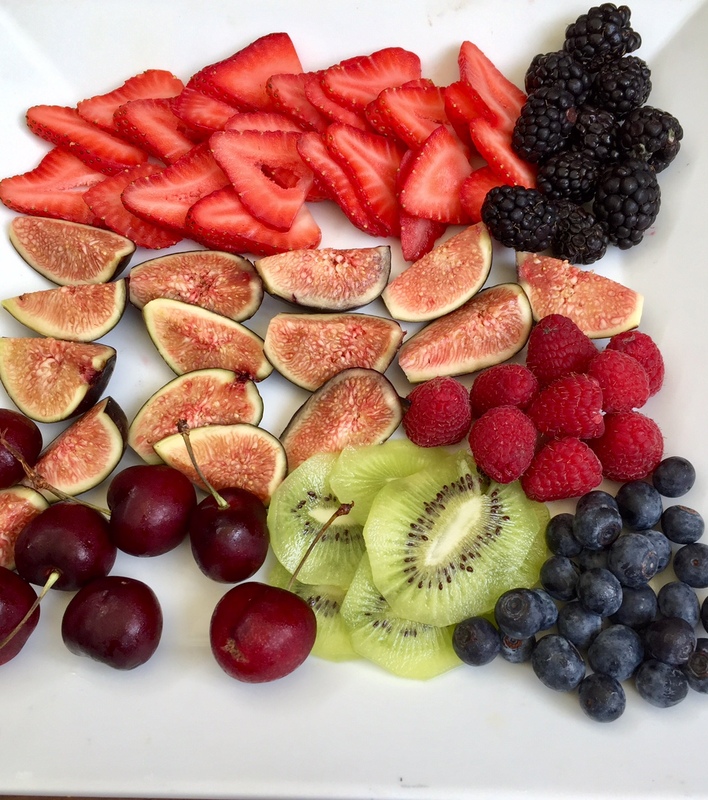 Oh, and fresh fruit. 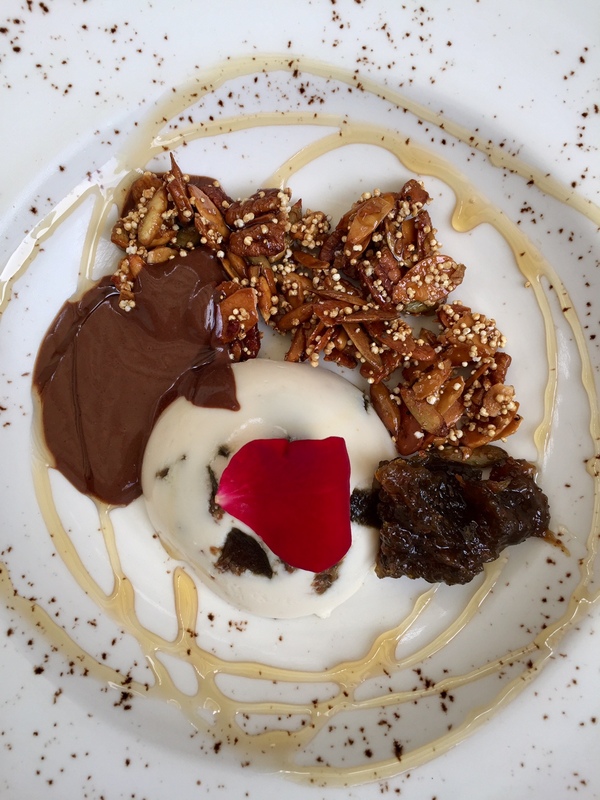 The figs were out of this world. I ordered this so we would all stay healthy. Back into the world of textiles, I want to show you some other beauties that we had the privilege to see this day. 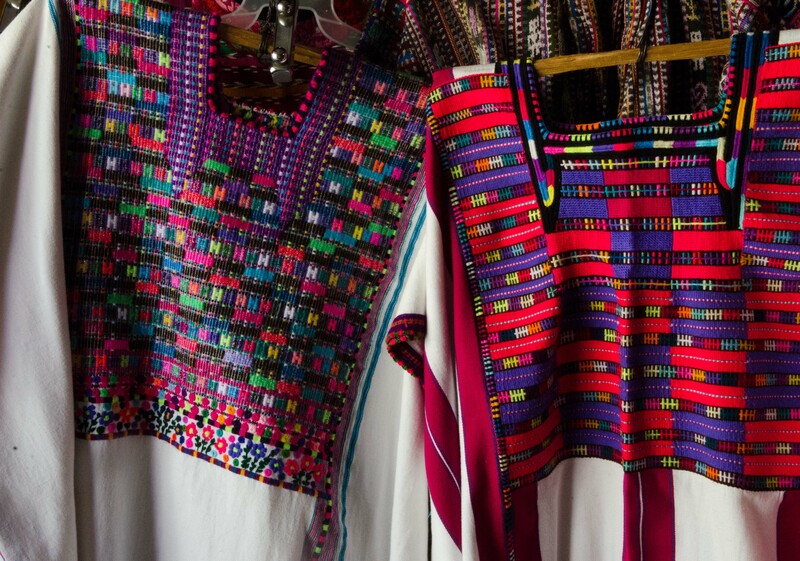 Oaxaca is a vast treasure trove of textile wonderfulness. In the colder mountain regions, the cottons are triple-ply and thick for warmth. Along the coast, the weave is much lighter gauze to cover-up but to also deal with hot, humid weather. Some villages weave. Others work in embroidery. 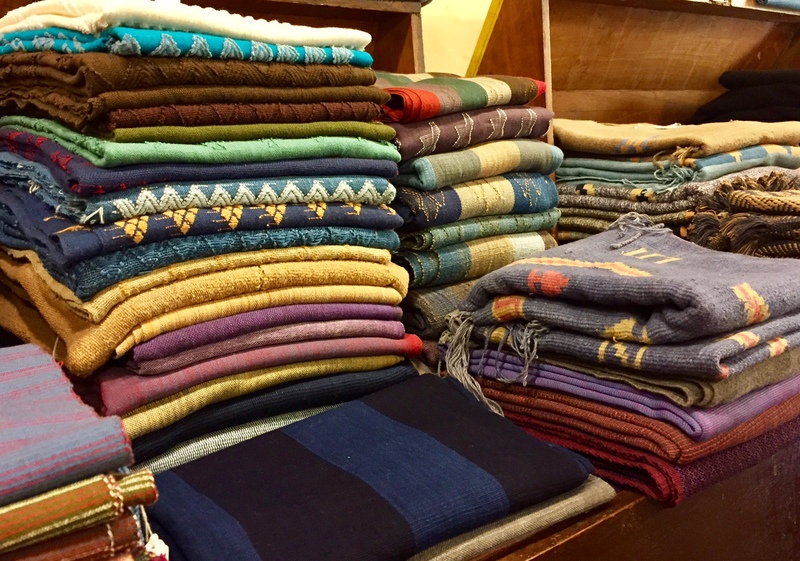 There is a reintroduction of silk weaving, and wool is a perfect wrap around material for rebozos (shawls) to protect from winter chill in the valleys. 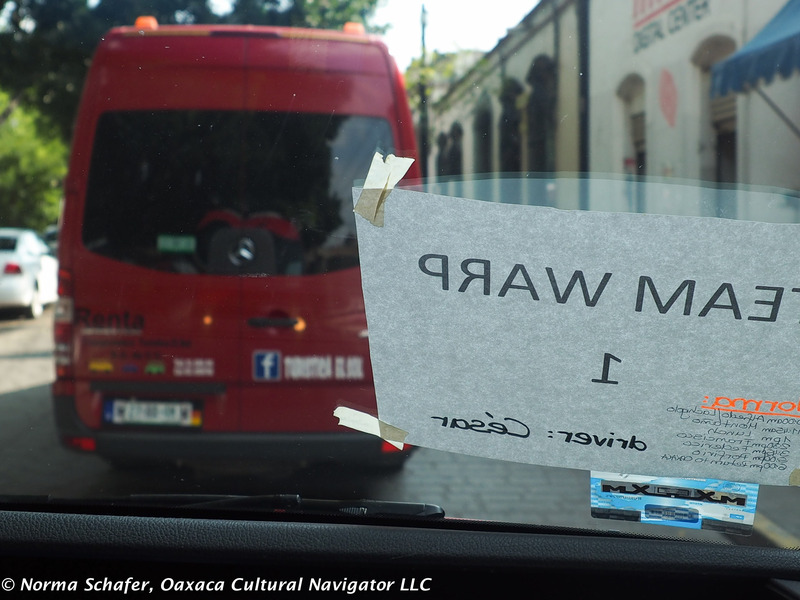 Last Saturday, 70 WARP conference-goers divided up and piled into four red vans to go on an all-day natural dye textile and weaving study tour that I organized. 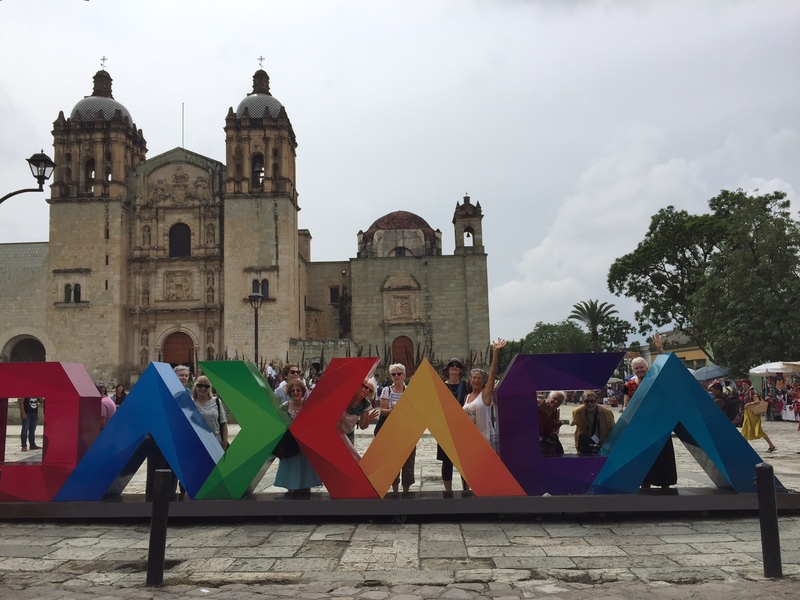 We left our Oaxaca hotel at 9:30 a.m. and didn’t return until after 7:00 p.m. (and in a rain storm). It takes much longer to move 70 people than it does to lead a small group of three! Of course, I couldn’t be on all four vans at once, so I had great help from dye master Elsa Sanchez Diaz, applied linguist Janet Chavez Santiago, and blogger Shannnon Pixley Sheppard who staffed the other three. Thanks to them and a schedule that brought us all together for lunch and an end-of-the-day reunion, the day went off without a hiccup. 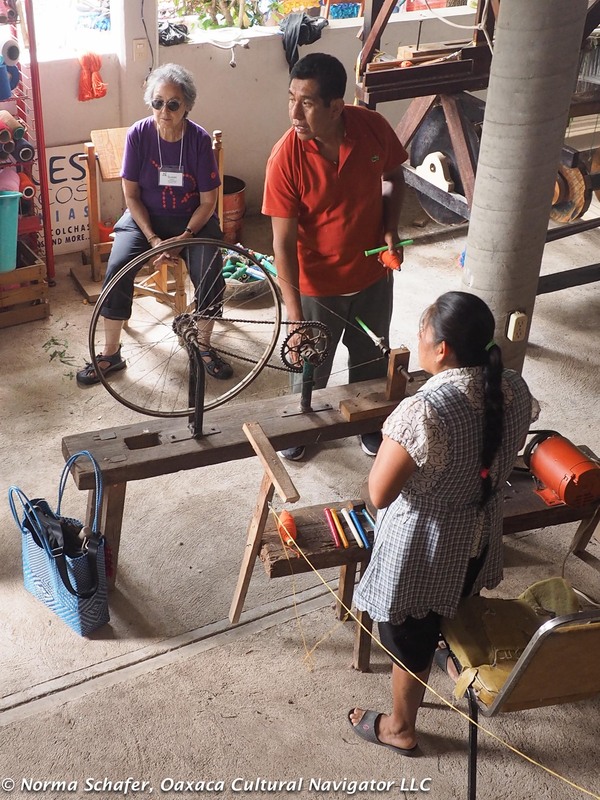 We hopscotched all over Teotitlan del Valle and made a detour to Lachigolo to visit weavers I know who work in naturally-dyed wool and cotton. 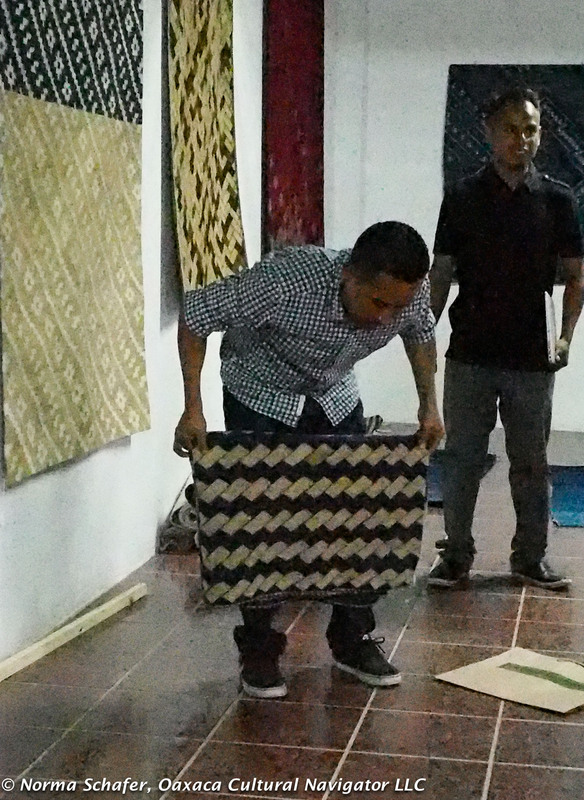 We got demonstrations of the natural dye process, tapestry loom weaving techniques using the fixed frame, two-harness pedal loom used to make rugs. 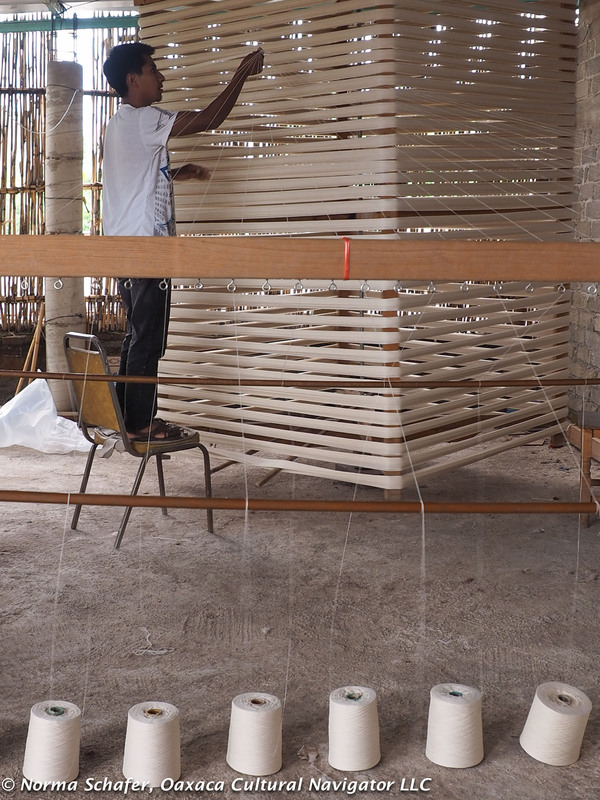 We saw the flying shuttle, four-harness loom that can make yards of cotton cloth with more intricate patterning depending on the sequencing of the foot pedals. 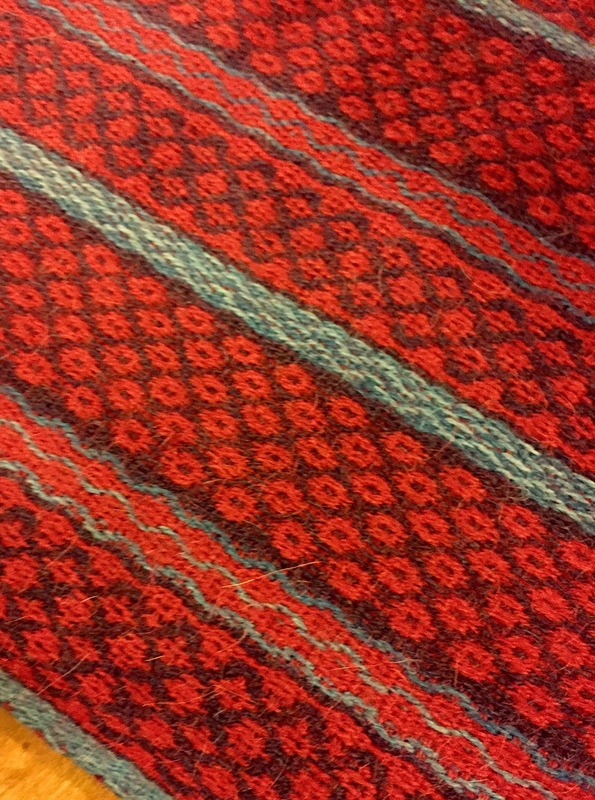 The cloth woven for clothing and home goods. 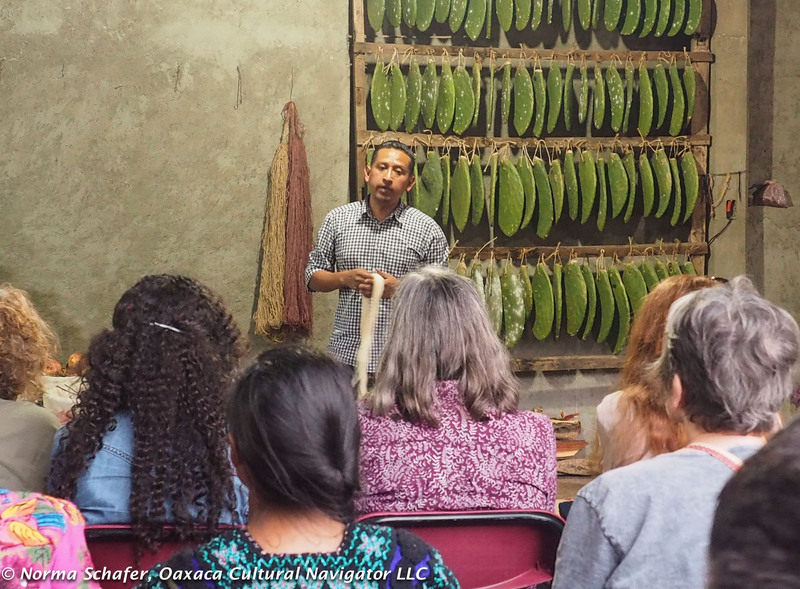 Most importantly, we had the opportunity to meet each family, understand how they work in collaboration and in family units, and see how they are inspired to make very distinctive products from each other. 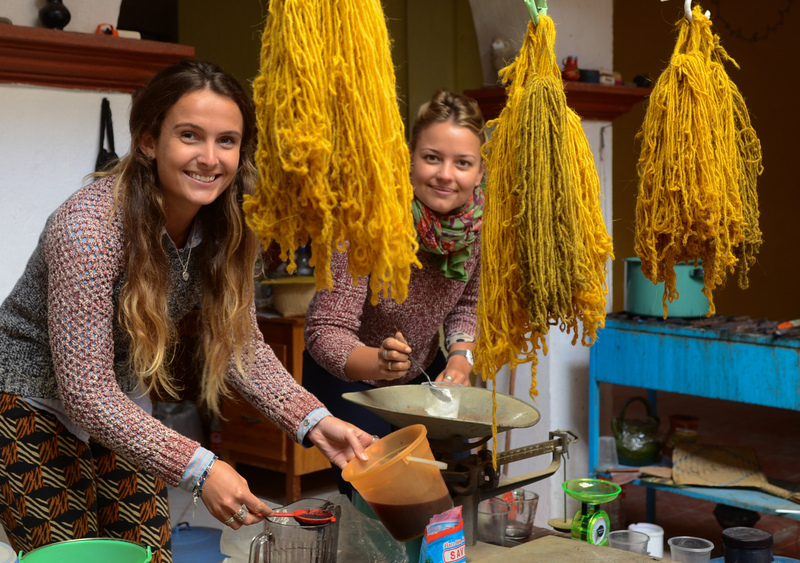 Every family has their own dye recipes and design adaptations. 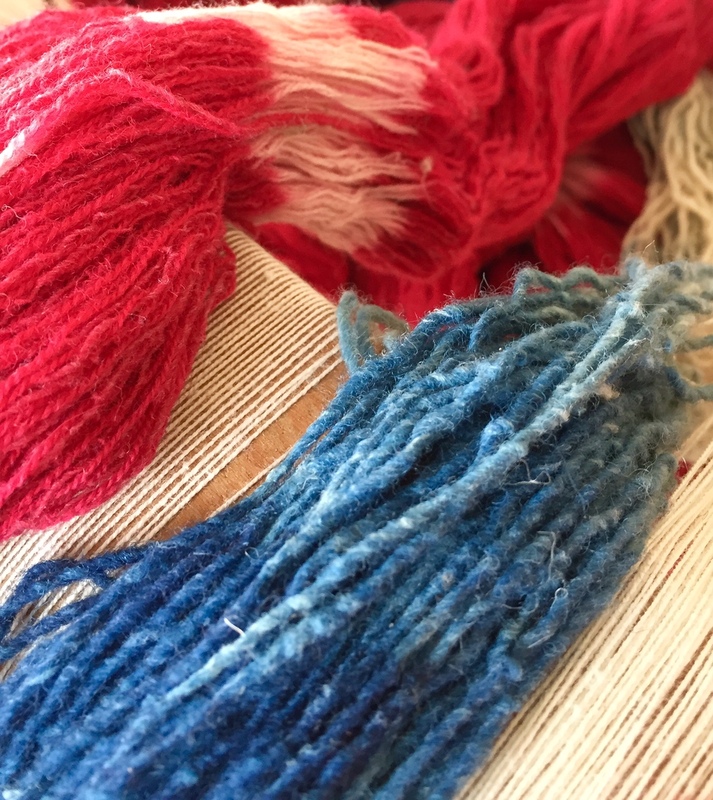 Some are doing very pioneering work, combining wool and agave plant fiber. 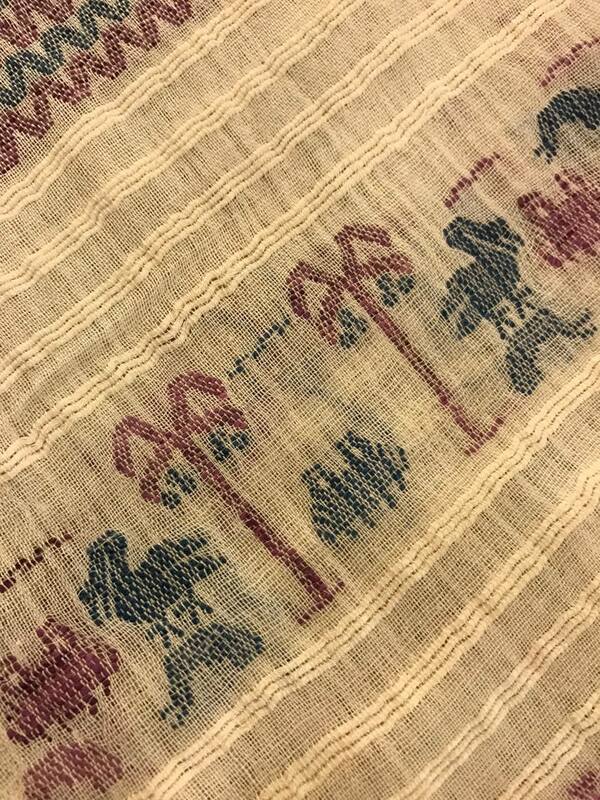 Some are doing very fine wall tapestries with 17 warp threads per inch. It is wonderful to see the range and variety of creativity and inspiration. 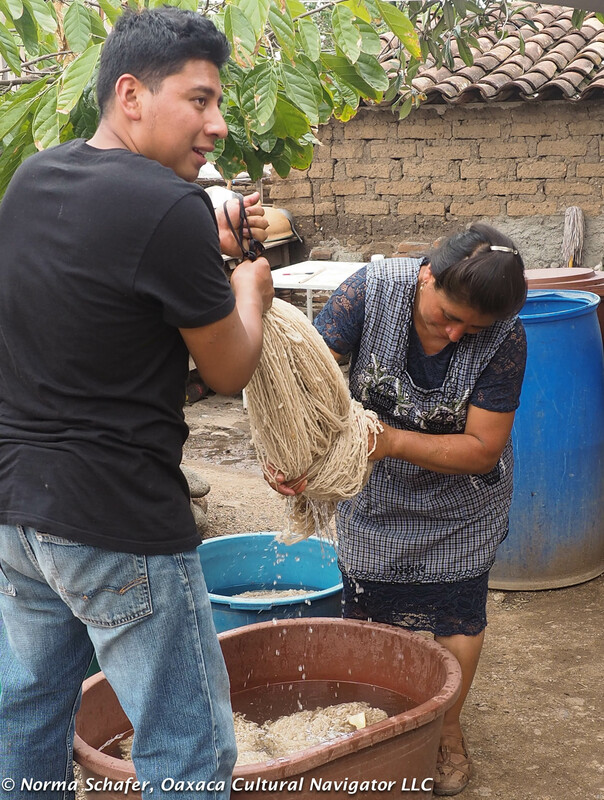 Alfredo Hernandez weaves the natural manta with the finest cotton threads. 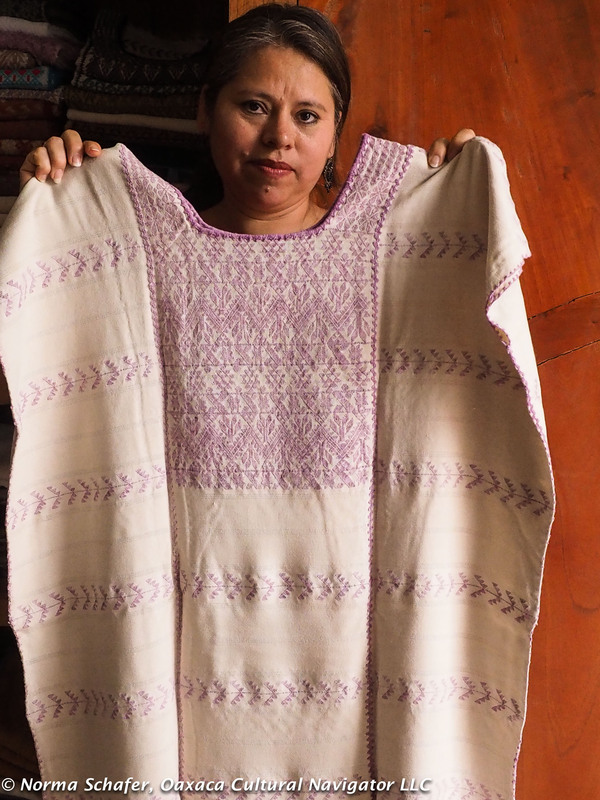 Then embroiderer Anacleta Juarez creates the most detailed, intricate finely stitched work I’ve ever seen. 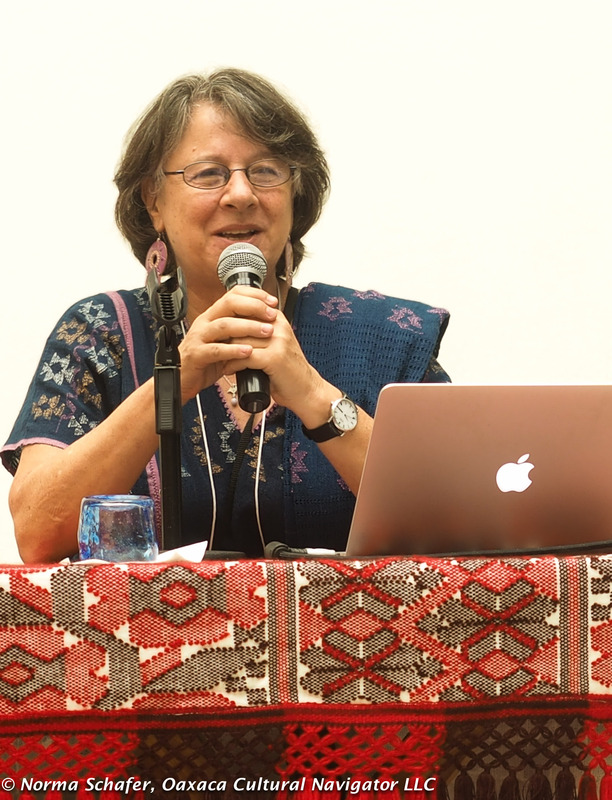 On day one, cultural anthropologist Marta Turok Wallace talked about the importance of collaboration to further innovation that will sustain tradition. 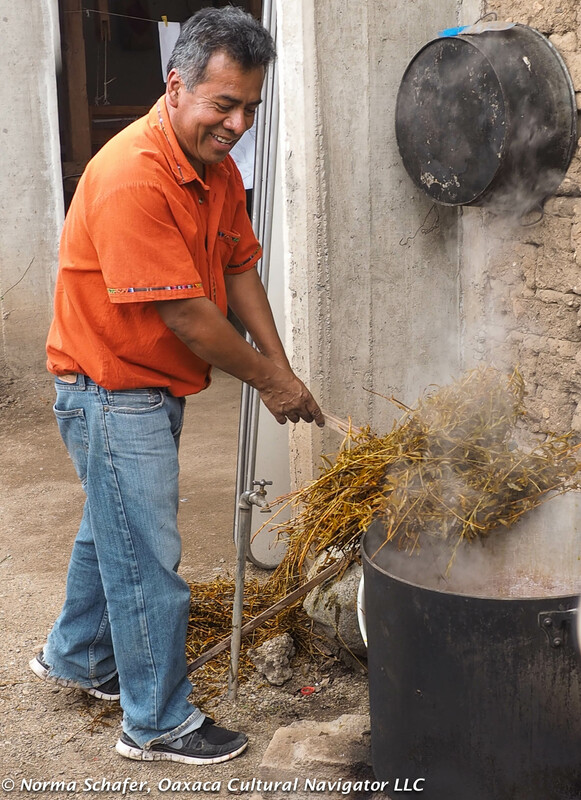 We gathered at the end of the day at the home workshop and studio of Porfirio Gutierrez and his family for traditional hot chocolate, bread, mezcal and a demonstration. 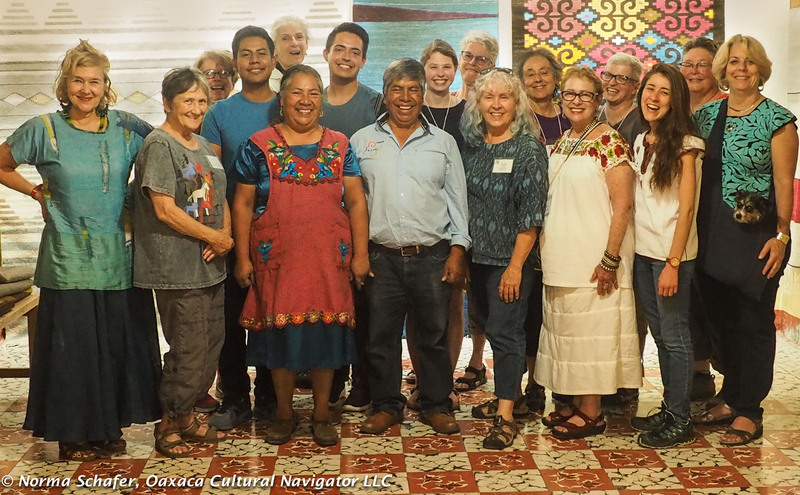 Big thanks, Porfirio, for your hospitality to welcome 70 people! 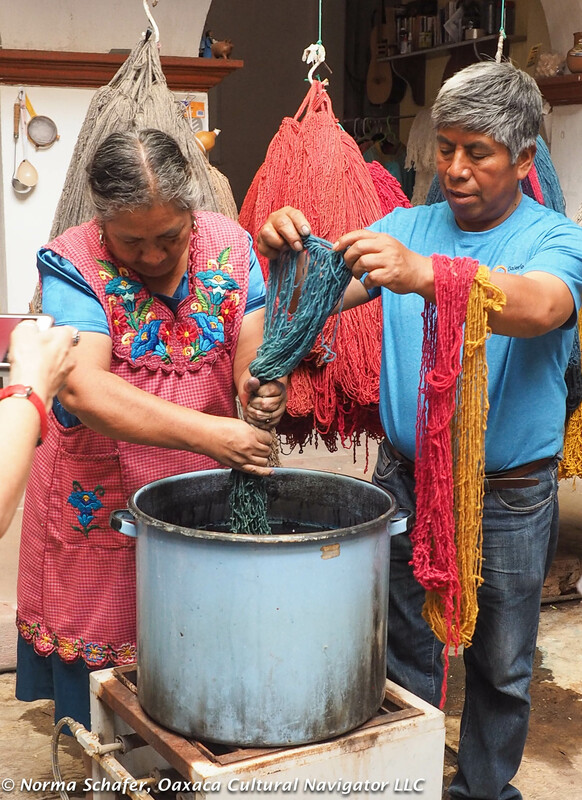 The family is working in wool dyed with natural plant materials and cochineal. 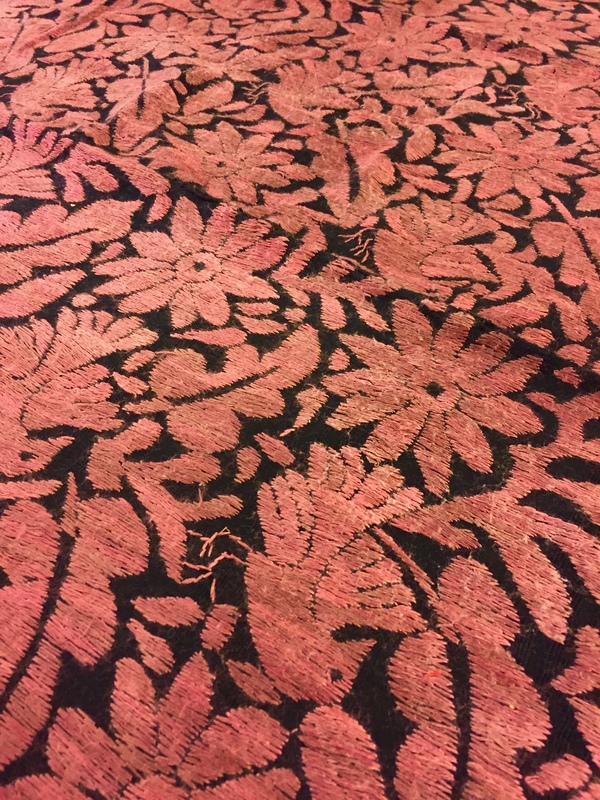 They are innovating with rug designs that resemble a petate that incorporates plant fibers like jute and ixtle. 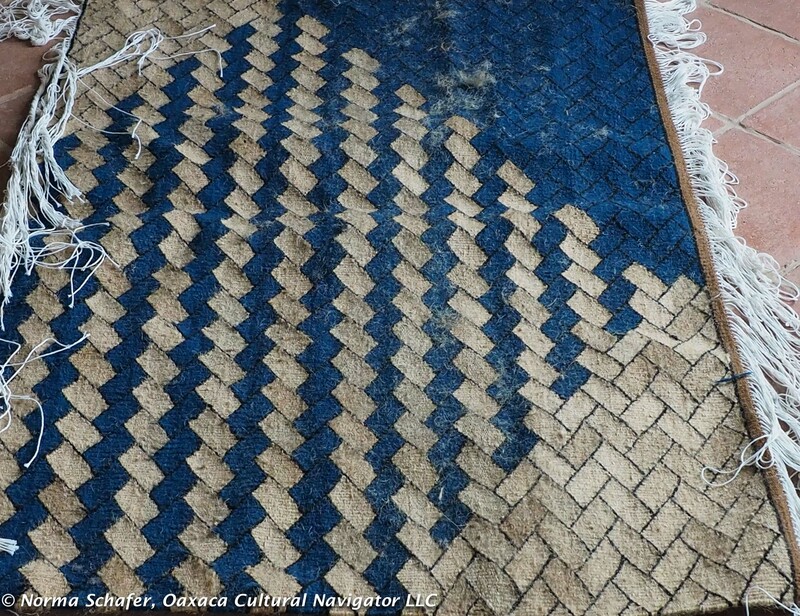 Wrapping up a petate design rug to go — a combo of jute and indigo! 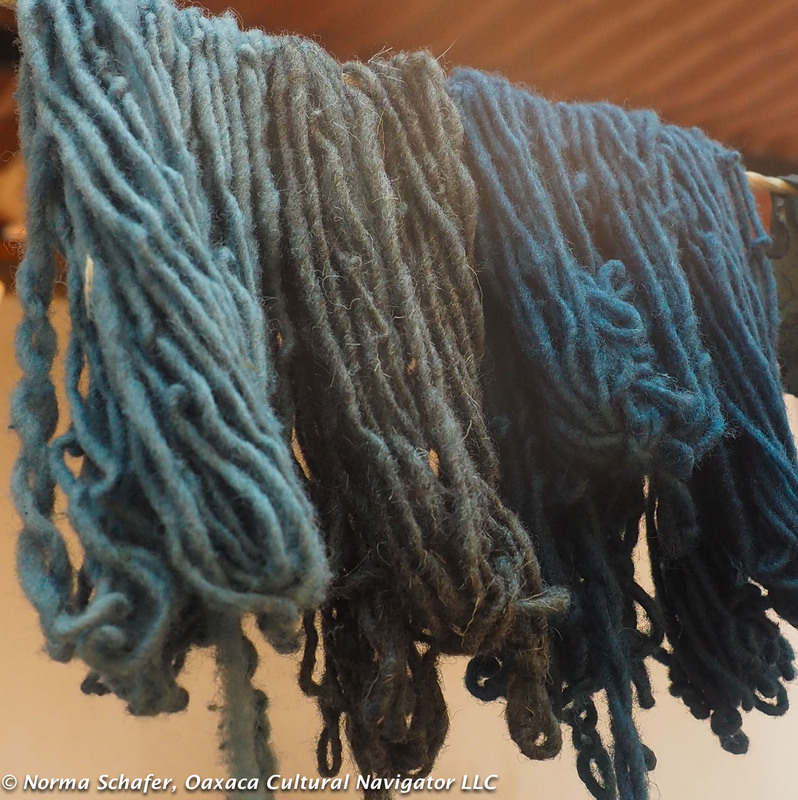 Almost every weaver here knows how to prepare a demonstration using natural dyes. Many have the materials on hand to show visitors. 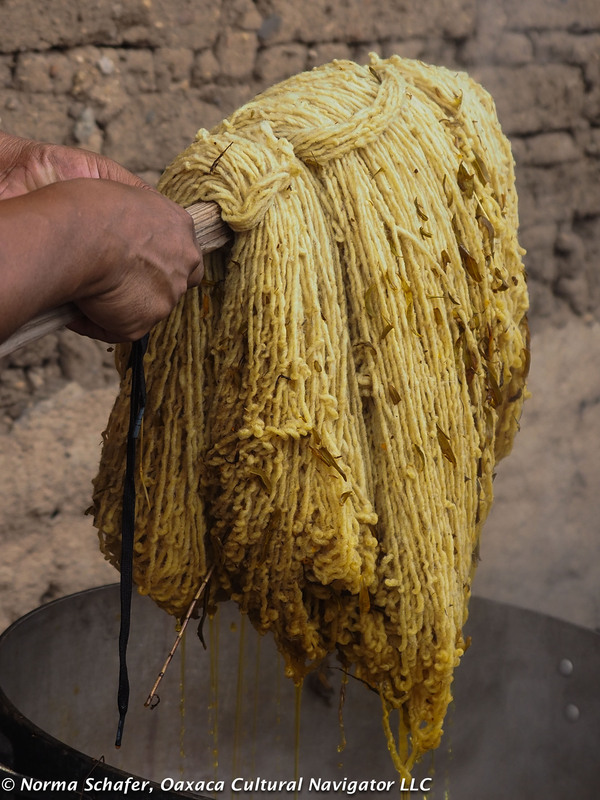 Yet, it takes half the time to prepare wool using aniline dyes as it does to prepare natural dyes. The dye materials are 10 times more expensive. 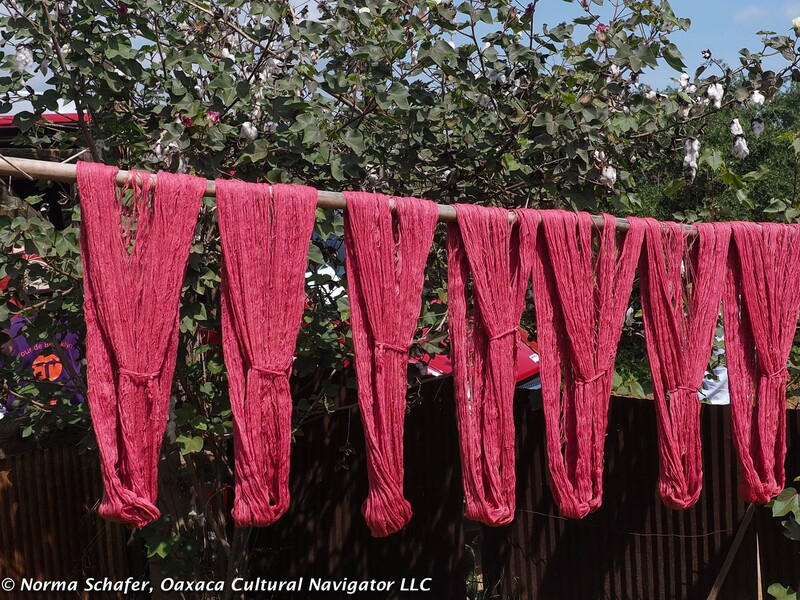 Some say that about 10 to 15 Teotitlan del Valle families may actually use natural dyes in their work. (I don’t know the exact number.) If this is important to you, you may want to join one of our one-day study tours to take you to them. The price will be higher for these beauties, but there is a distinctive difference in color palette and quality. The little red vans that could! Gracias, Silvia and Cesar. 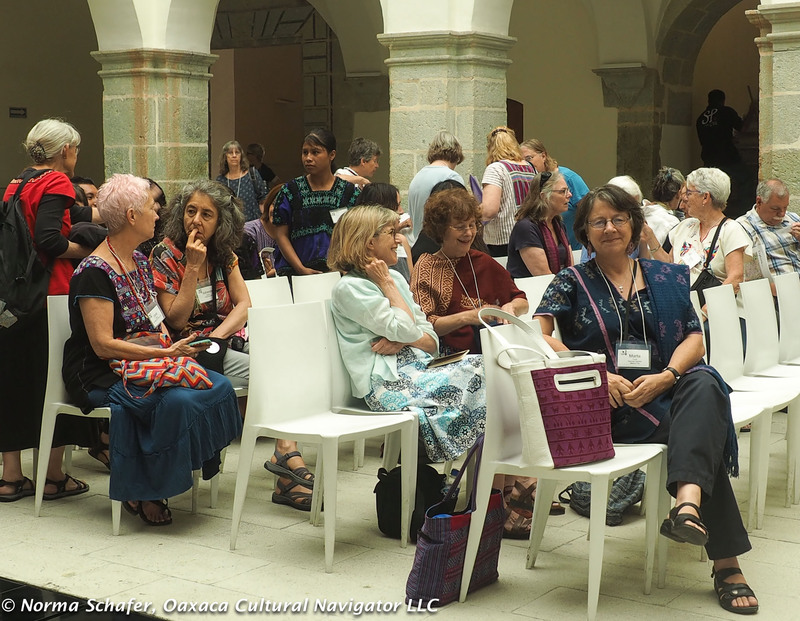 One more post about the WARP Conference in Oaxaca, 2017, and the walking tour of the historic center that Janet and I led last Sunday. 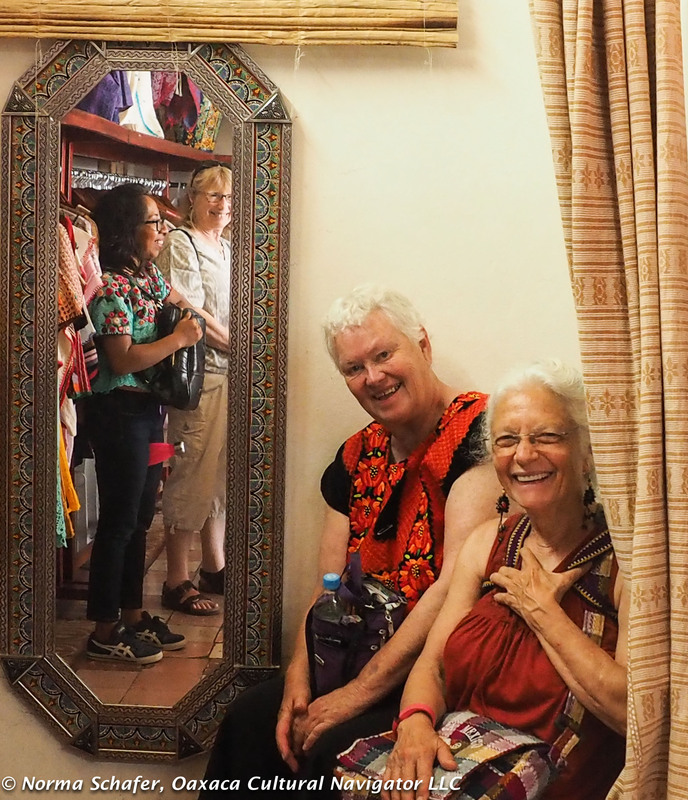 We explored the nooks and crannies, found paper earring for Louise, good strong coffee for Diane. 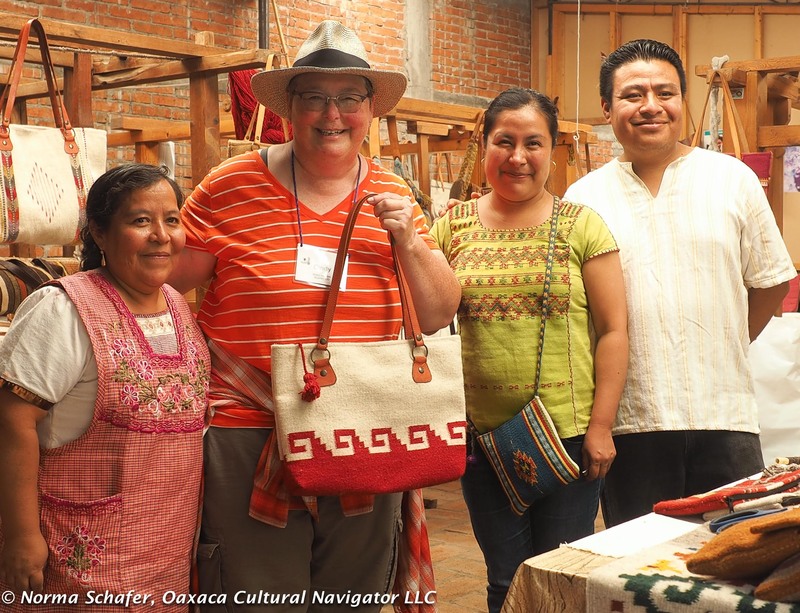 In two outstanding galleries, we had talks from owners and managers about quality differences in materials, dyes, and hand-looming. 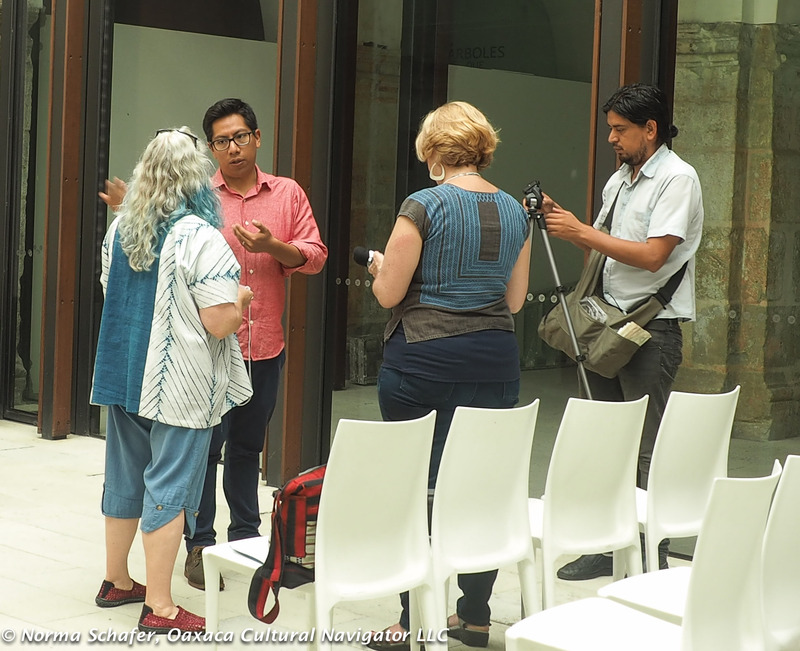 Thanks to WARP for coming to Oaxaca, and thanks to you for reading. 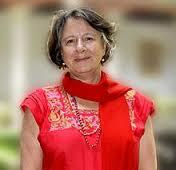 Marta Turok Wallace is a noted applied cultural anthropologist whose specialty is Mexican textiles. 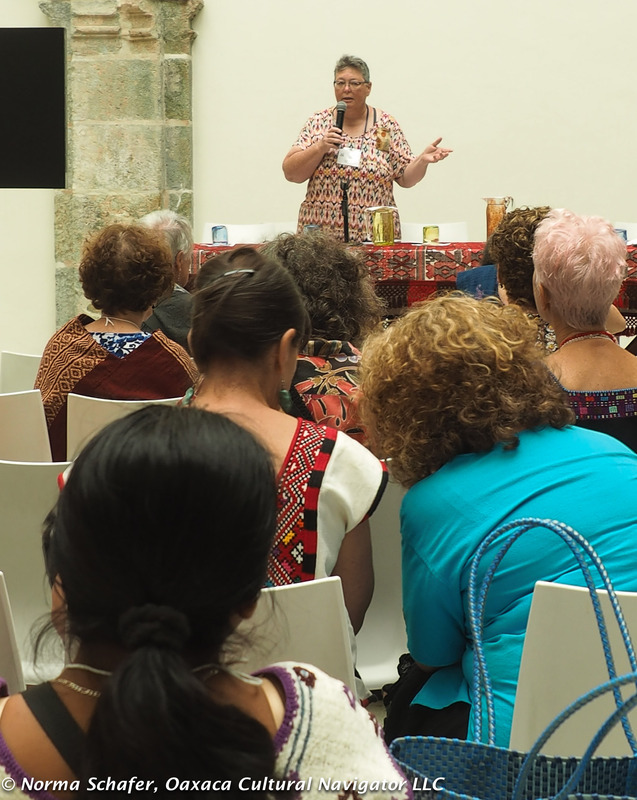 A resident of Mexico City with roots in Boston, Massachusetts, USA, (her parents were ex-pats), Marta was invited by program chair Judy Newland to speak at the WARP (Weaving a Real Peace) textile conference held in Oaxaca, June 8-11, 2017. More than 70 people attended the conference. They came from Mexico, the USA, Canada, Poland and Russia. 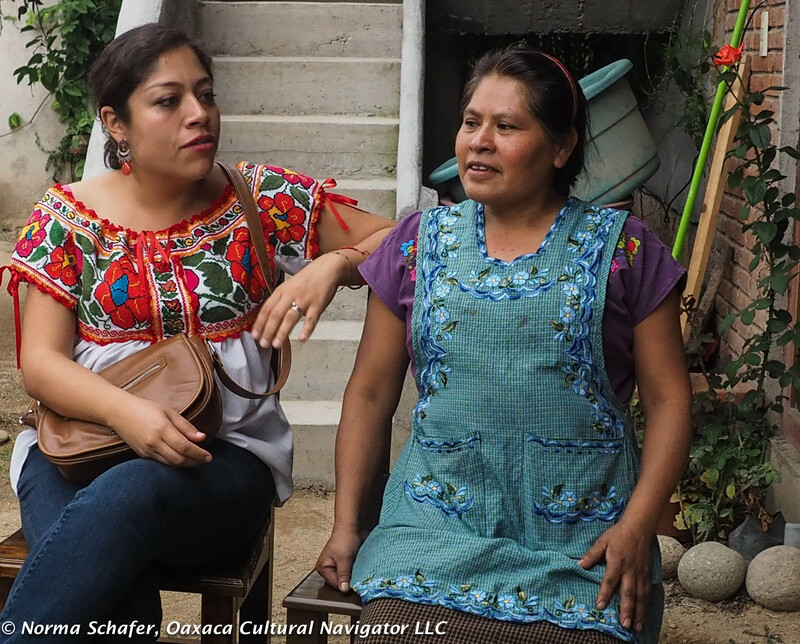 What Marta talks about concerns all of us who love indigenous textiles and appreciate the people — women and men — who make them. She asks questions, makes observations, offers solutions and consultation. Then she steps back and listens, suggests, guides. She affirms that weavers can create their own destiny, their own future for themselves, their families and their communities. 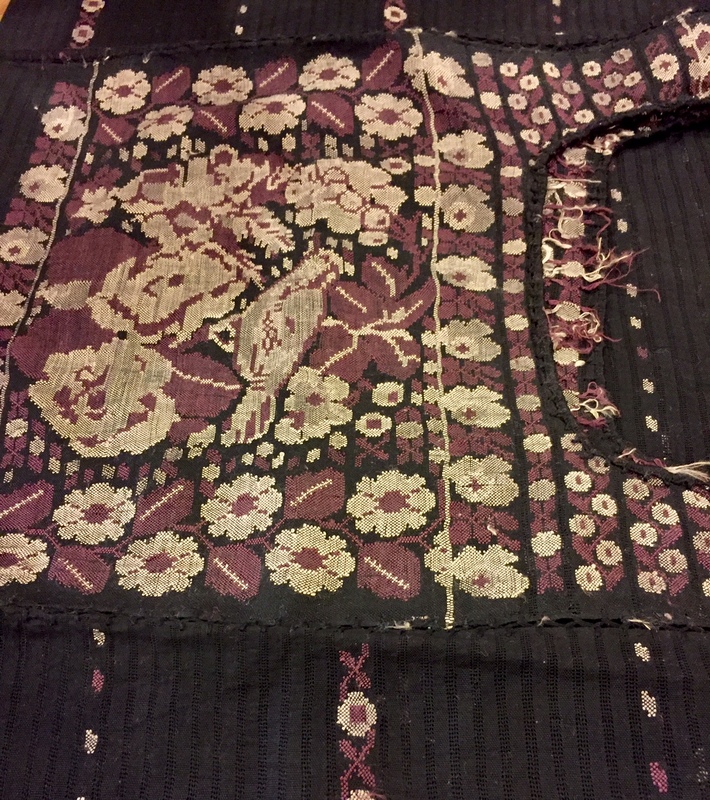 And, that consumers can more fully appreciate the history behind the cloth. 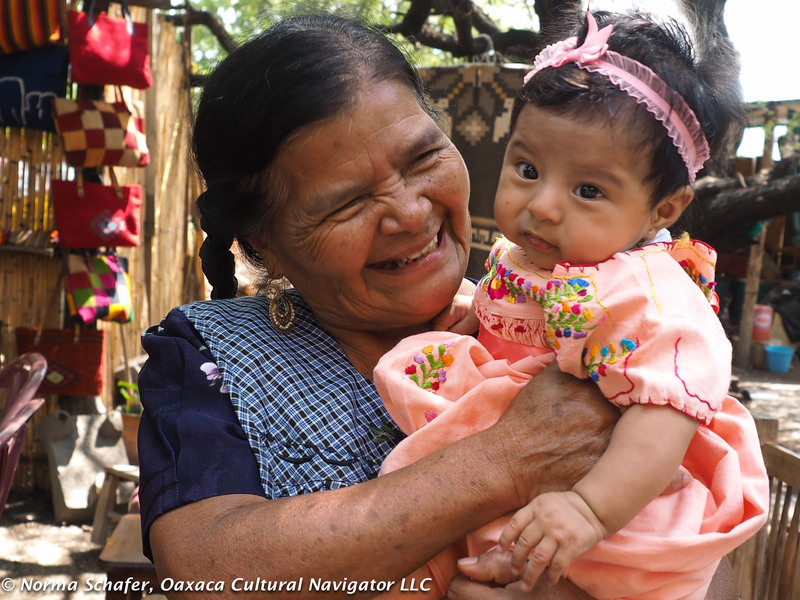 Traditions are powerful in Mexico. 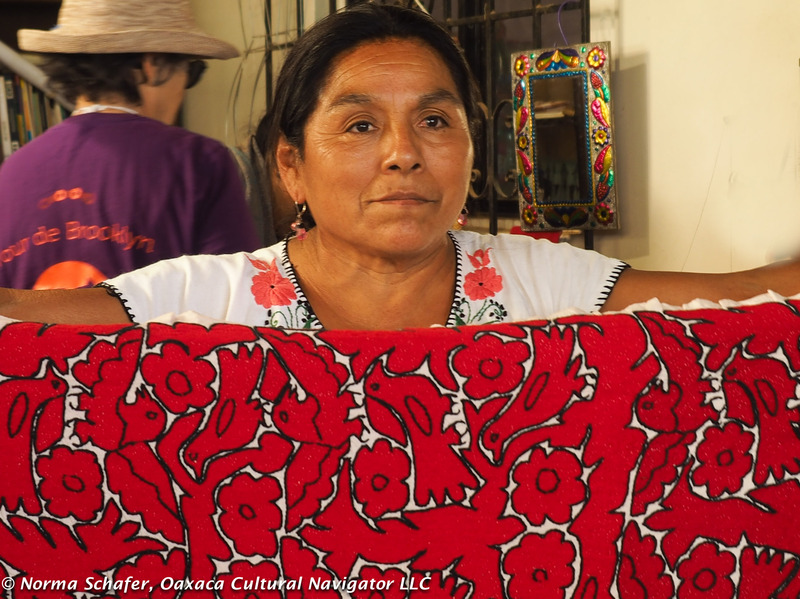 Remote villages throughout Oaxaca continue to weave garments using distinctive iconographic designs particular to place. 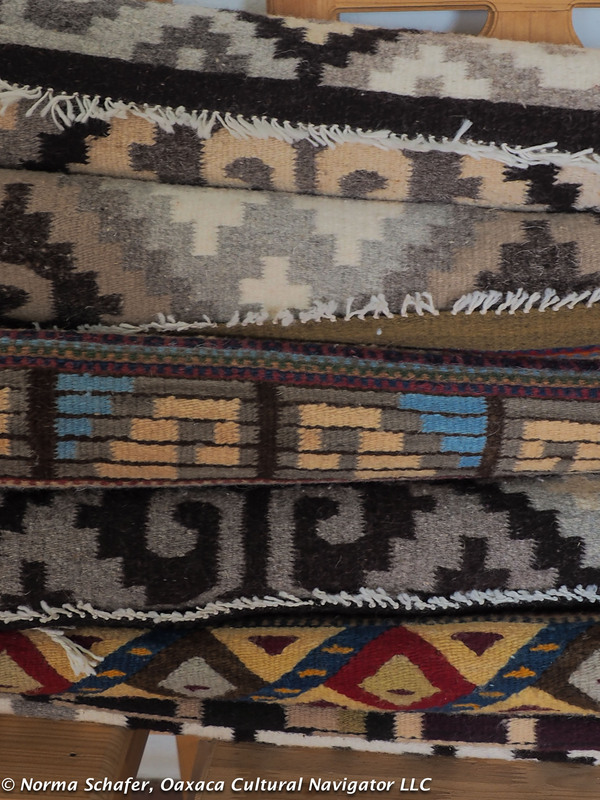 These weavings are rooted in centuries past, worn by grandparents and great-grandparents. There are garments for daily wear and special ceremonial occasions. 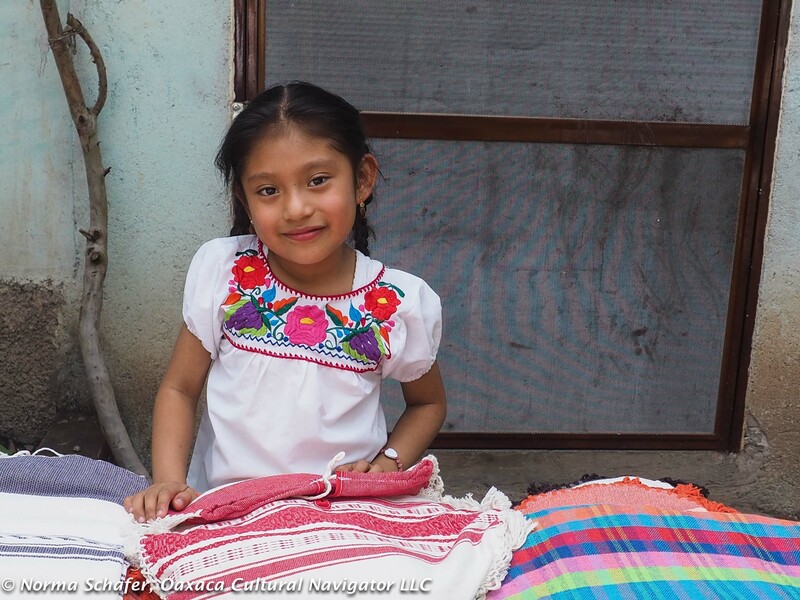 Clothing is cultural identity in Mexico. It signifies where you are from and your status in the community. 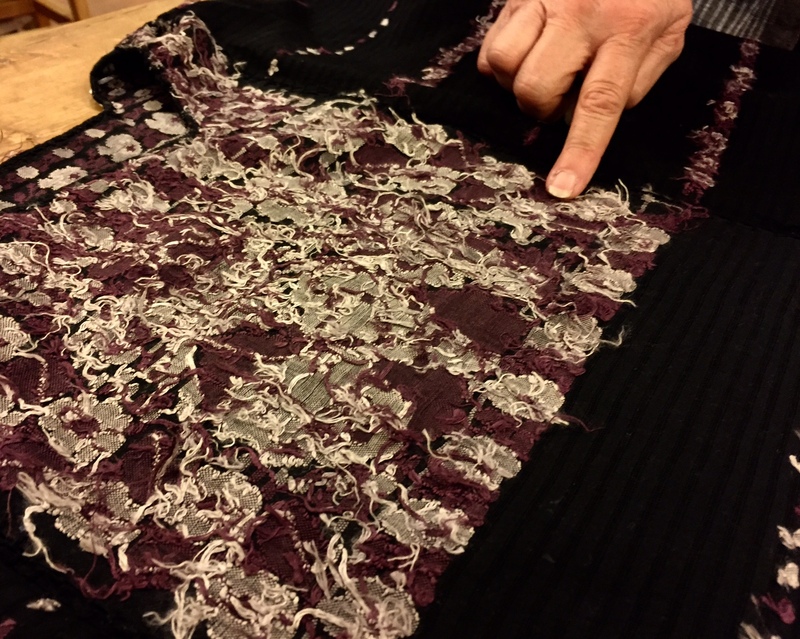 Yet, over time, clothing has changed (think cotton to synthetic threads, hand-spun to machine-spun) based on cost of raw materials, time to make, and influence of current fashion trends in the larger culture. This has an impact on style, design and quality. As villages interact with each other because of communication and ease of transportation, there is design-crossover, too. What is “pure” or “authentic” is no longer relevant, perhaps. Change happens and it is impossible to keep people in a box doing what they have always been doing to satisfy collectors and appreciators of tradition. What we want to do is encourage innovation, collaboration, independence and economic success. 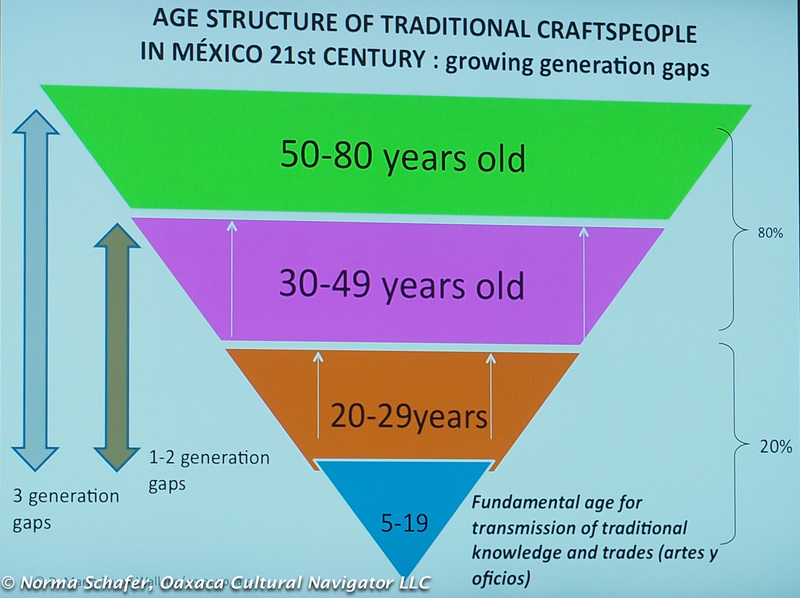 Marta showed a slide explaining that there is a 50% loss of traditional artisans in Mexico. 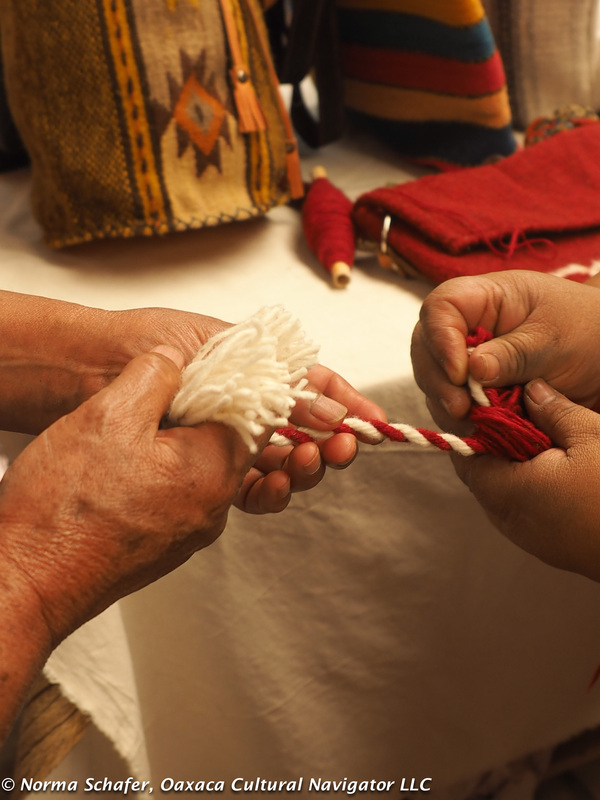 Artisans are aging out and so few of the next generation are stepping in to continue the work. She asks, Why is tradition dying out? 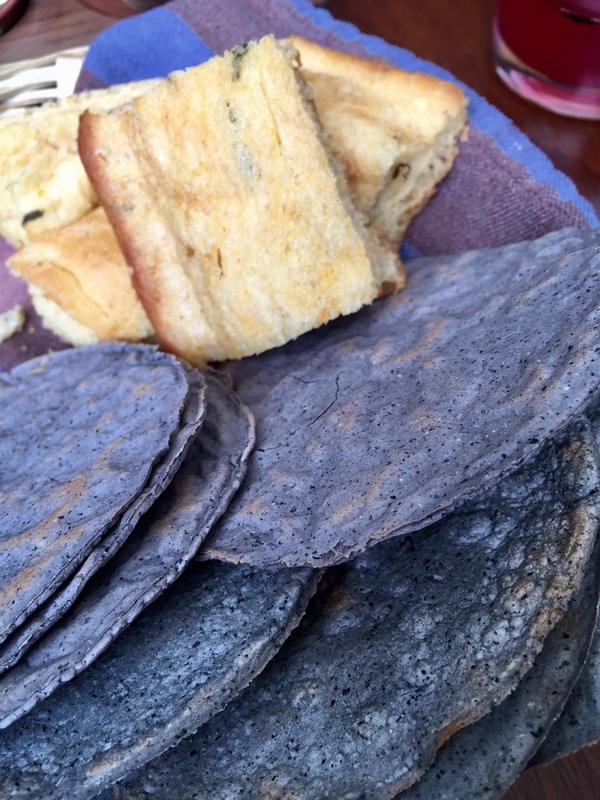 Is the acquisition of artesania being abandoned by the consumer? What is happening in the communities to impact this change? What is in need of revitalization? 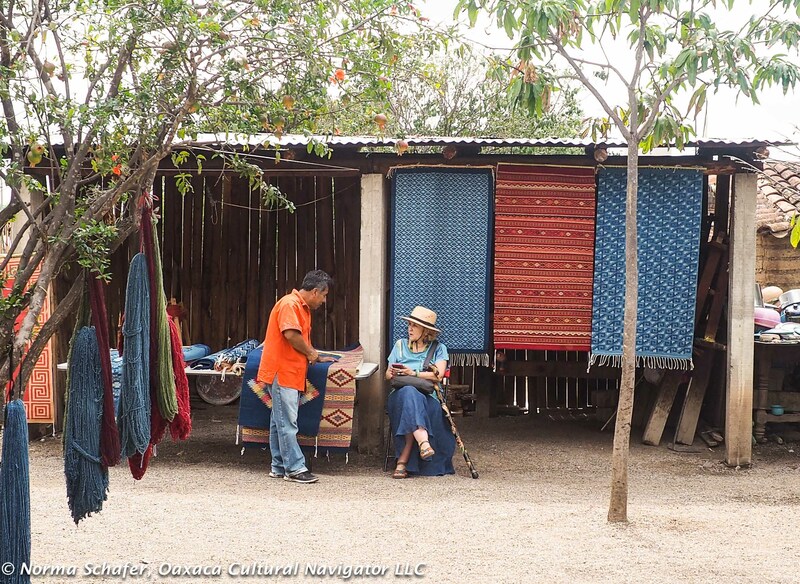 How do you prepare artisans to sell at fairs and expoventas? How do they show things, take orders, fulfill and ship? Are goods priced fairly for the amount of time put into making them? What are people willing to pay because something is made in Mexico? How do you commodify art, handmade? So, it’s not only about keeping the skill alive, it is about getting it out into the marketplace? Once something becomes commercialized, then does that erode its value and also compromise how an artisan is compensated? As they say, It’s complicated! 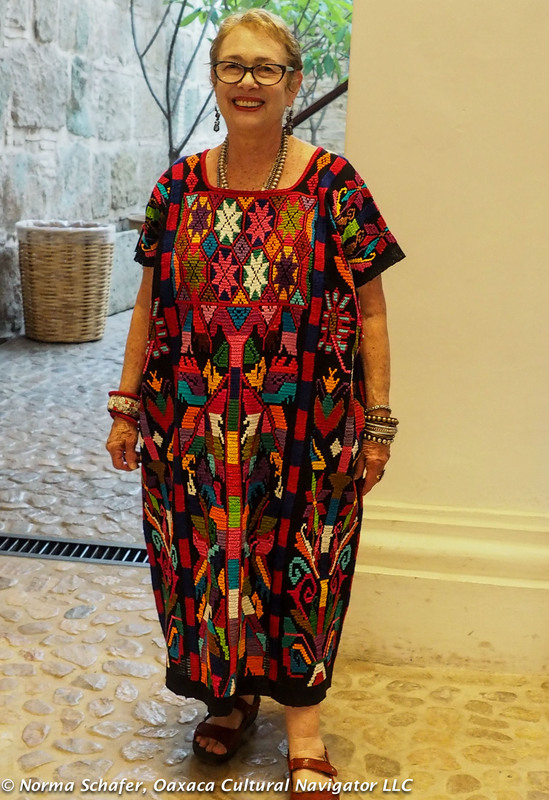 And, if one changes the scale of motifs or introduces different color palettes to satisfy marketplace demands, or adapt a textile to another purpose (think going from sarapes/ponchos to rugs to handbags and purses), is this a compromise of traditions? 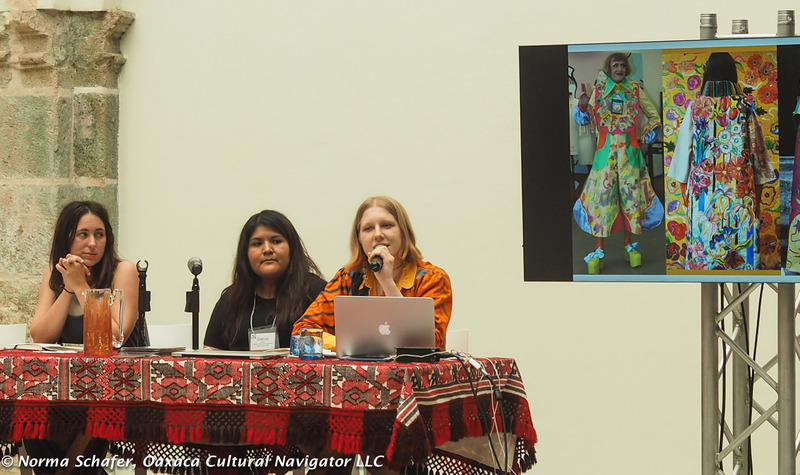 Important topics of discussion during the conference included appropriation of traditional design motifs by contemporary fashion designers, fair wages, using sustainable and native materials. “What is Fair Trade, really?” when there are no standard rules. 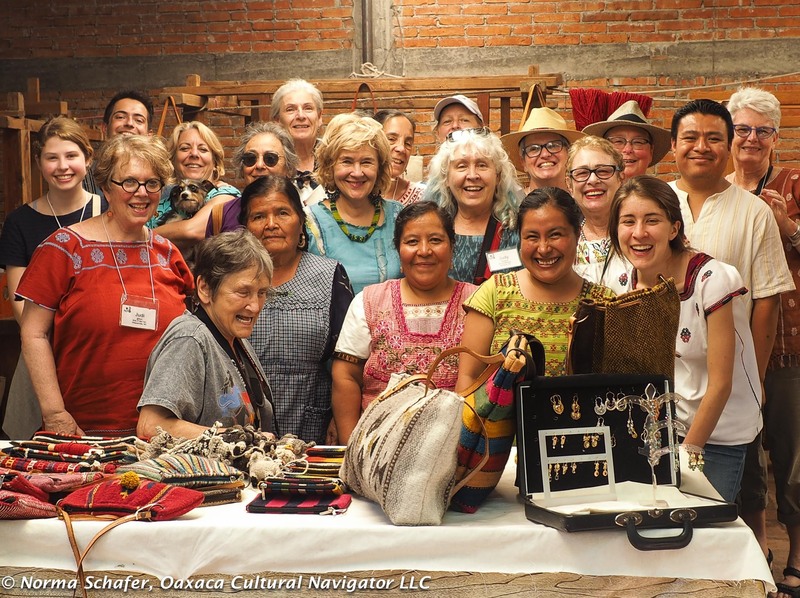 Marta notes that when something is handmade AND mass-produced, someone is not being paid very well. 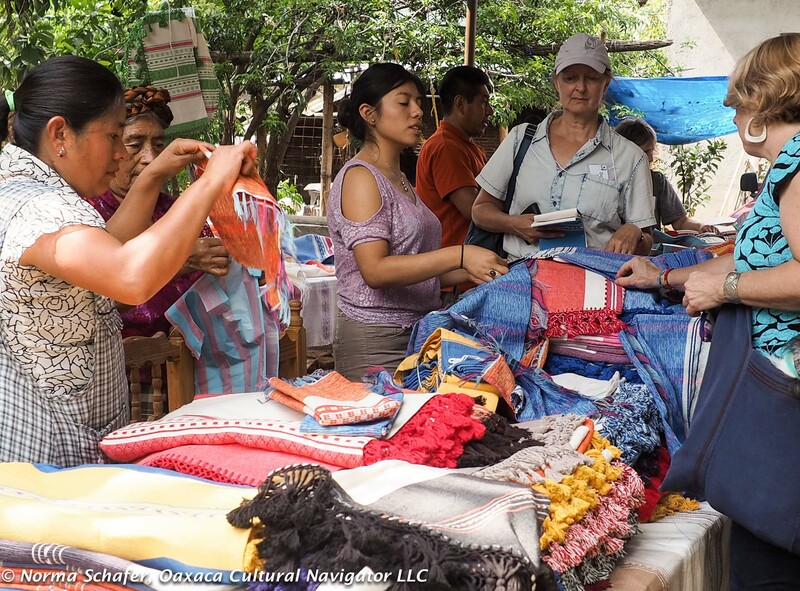 Many of us want to meet the artisan, have a personal relationship and buy directly so that the money exchange benefits the maker 100%. That’s not always possible, so it’s important for us to read labels, and ask who made my clothes. 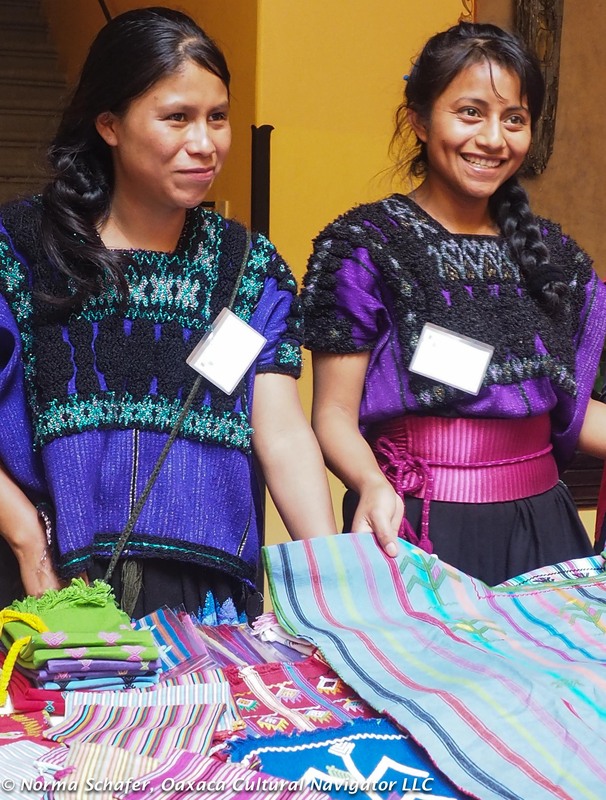 We also need to be sensitive and conscious to the myth that Mexican handmade items are cheap or that we can bargain just for the fun of it. Let’s be conscientious about the haggler mentality. 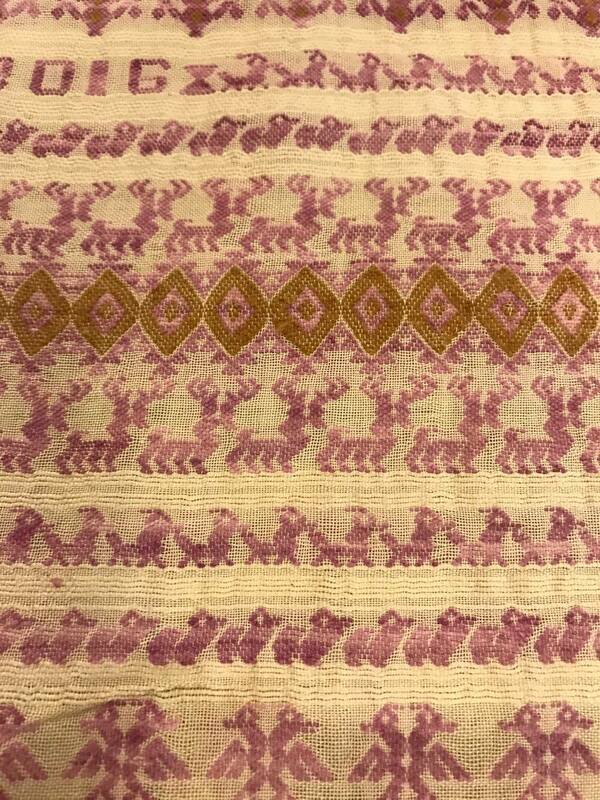 What we also notice is that most weavers are no longer creating cloth for themselves — they are weaving for the marketplace, no longer investing a year of labor to create an elaborate ceremonial huipil. They may dress in ready-made cotton or polyester purchased at Soriana or Walmart. Why? 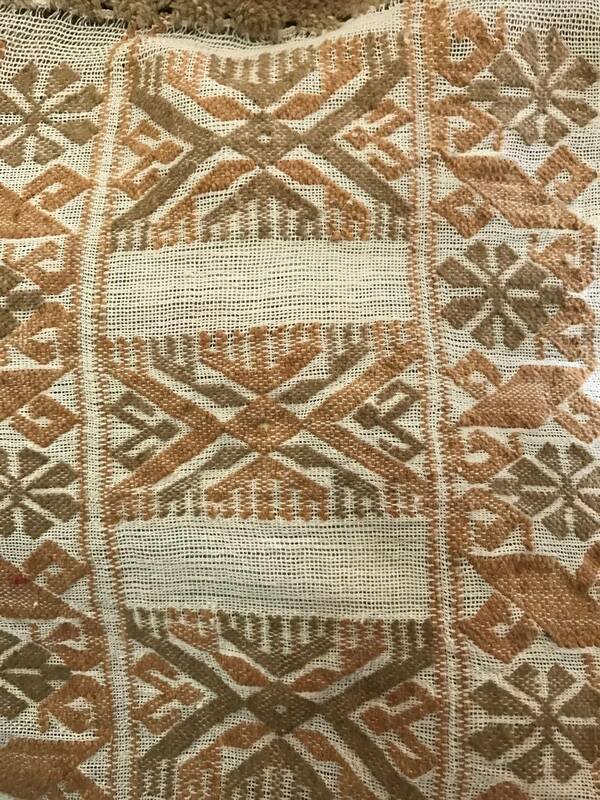 SOLD: Hand-woven, embroidered ceremonial huipil, San Felipe Usila. To dress differently exposes one to racism and discrimination. 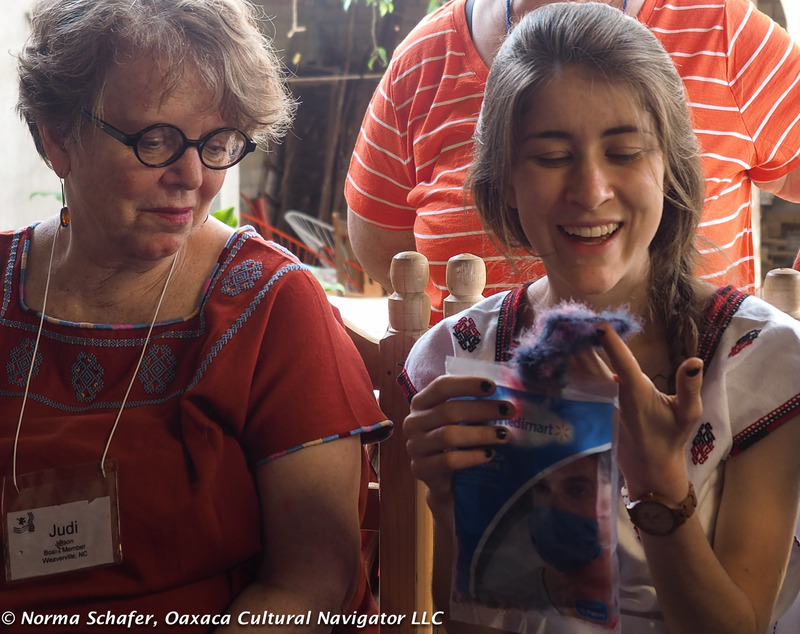 We heard a story about a Oaxaca village where the mayor was so intent on assimilation, that he forbade any weaving of traditional garments. 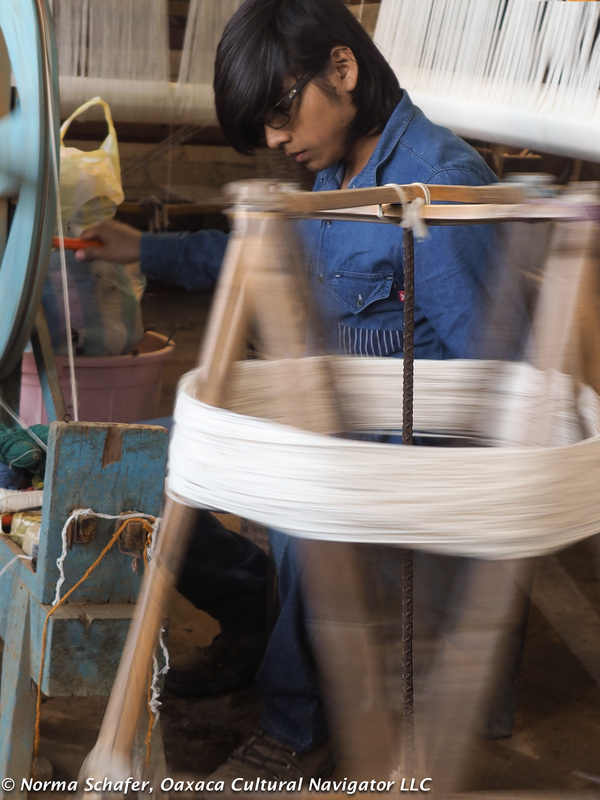 It took thirty years to rescue the tradition by encouraging a new generation of weavers to bring back their cultural identity. 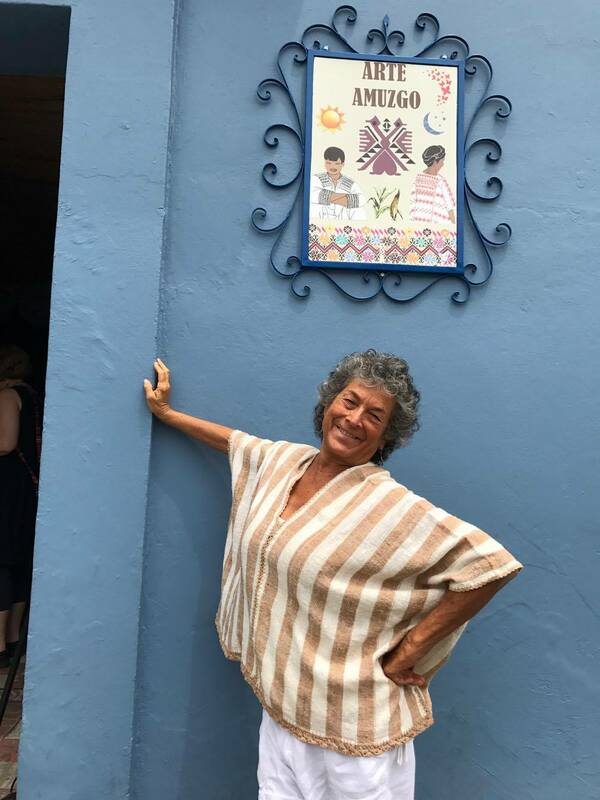 During the conference, Andares del Arte Popular hosted a curated show and sale of artisans in an adjacent patio. 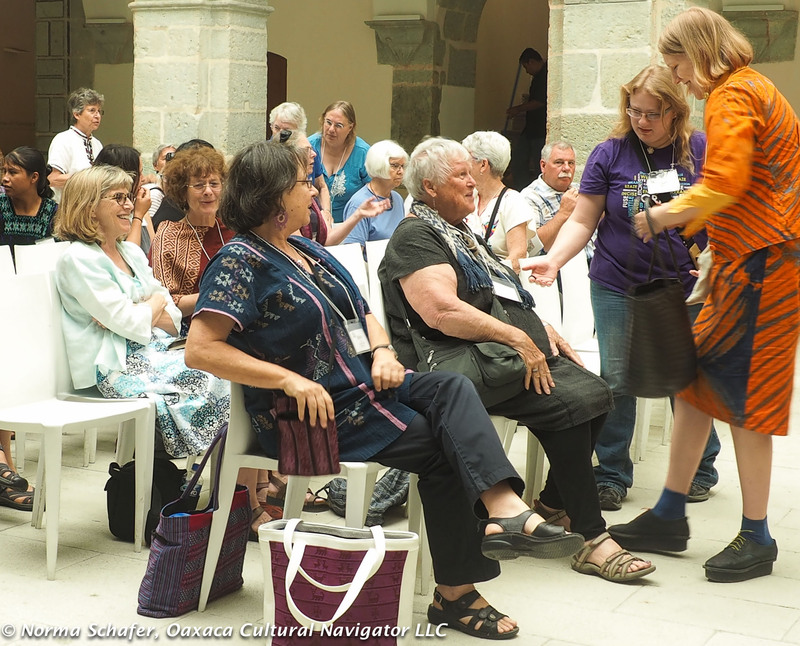 Conference-goers could meet the makers and buy directly from them. 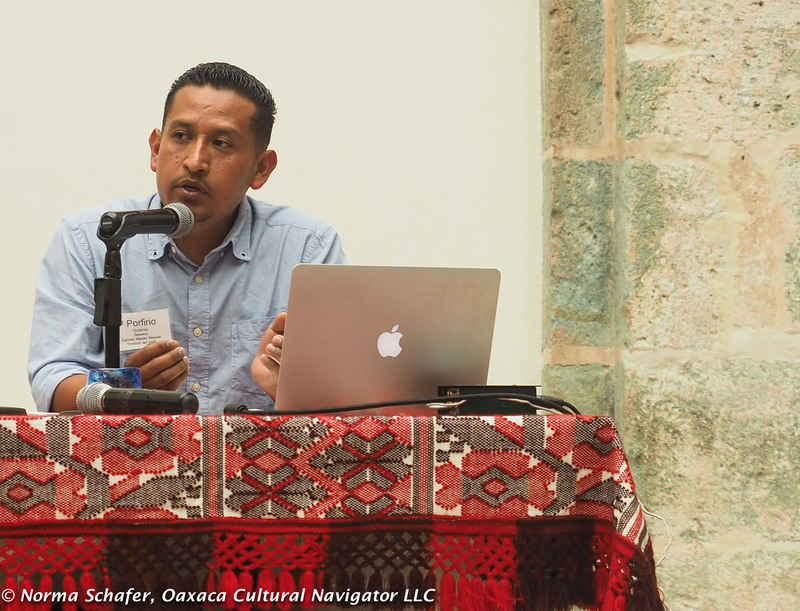 It was a wonderful introduction to Oaxaca for WARP. I was pleased to to work with WARP to produce this conference. 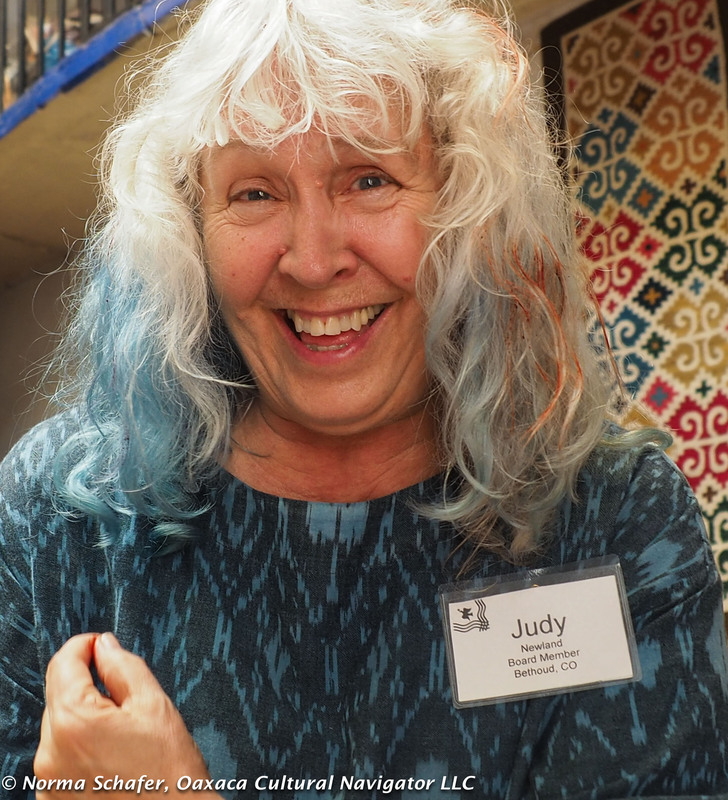 I served as the on-site administrator and conference planner, participated on the program committee, contacted speakers, organized a panel discussion, arranged for hotel, meals, conference venue, transportation, and a one-day natural dye textile tour for all conference attendees. 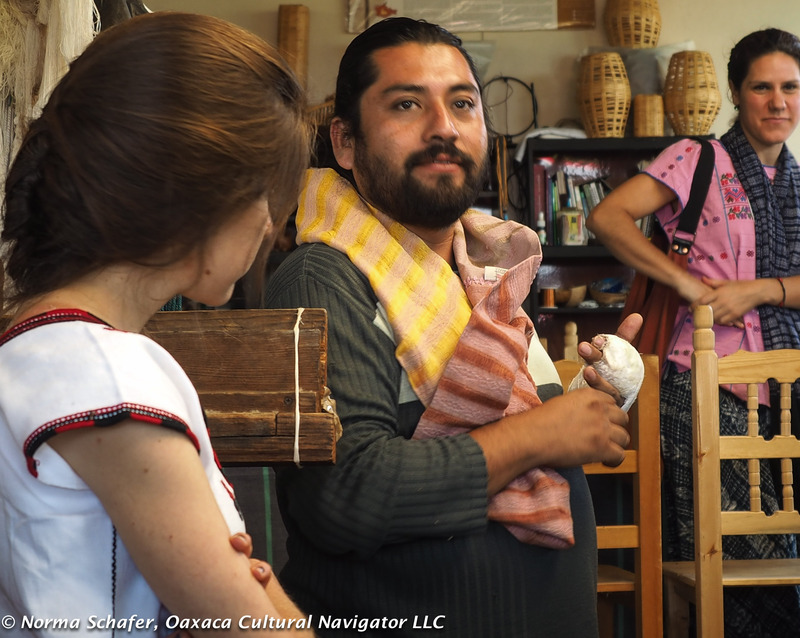 We went to villages to meet artisans and understand the complexity of the creative work of Oaxaca. 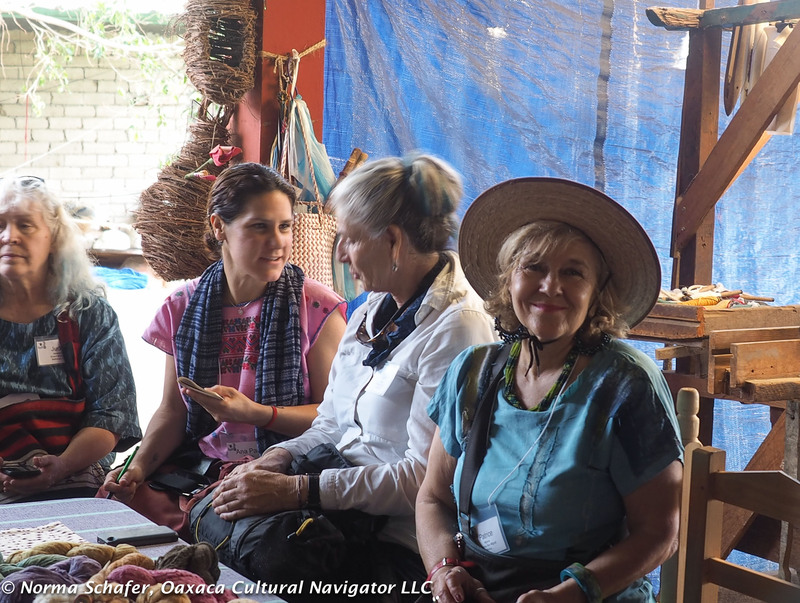 On Sunday, 12 women accompanied me on an optional walking tour of Oaxaca with a focus on naturally dyed textiles. More about this in the next posts.